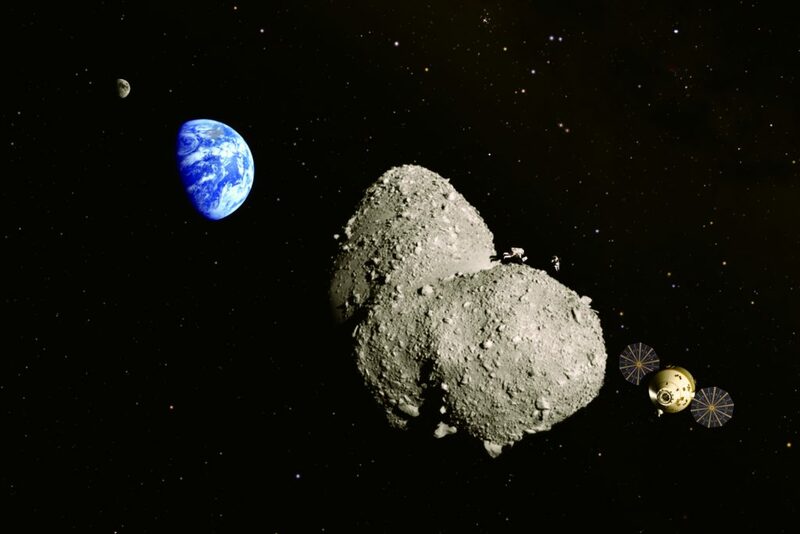 A newly discovered asteroid will orbit in loose formation with Earth for centuries. Its presence reminds NASA exploration planners of attractive opportunities for robotic and human exploration as they examine varied paths toward deep space and Mars. In April, astronomers sifting through images from the University of Hawaii’s Panoramic Survey Telescope & Rapid Response System in Maui discovered a faint near-Earth asteroid, now designated 2016 HO3. Analysis of its orbit soon showed that the 50- to 100-meter-wide object circles the sun on a path very much like Earth’s, f lying formation within a few million miles of our planet for at least the next century. The discovery of HO3 underscores the practical possibility of exploring nearby asteroids as a way to gain valuable deep-space experience in preparation for journeys to Mars. A skeptical Congress seems unwilling to fund NASA’s proposed Asteroid Redirect Mission, a crewed mission to an asteroid fragment placed in lunar orbit. HO3 and other, even more accessible asteroids may serve as alternate destinations: far enough beyond the moon to test astronauts on a multi-month, deepspace expedition, but not nearly as challenging and risky as a full-up, multi-year journey to the red planet. A reasonable path toward Mars may take astronauts from a lunar orbit outpost, to one or more near-Earth asteroids, and then to the Mars system in the 2030s. As HO3 alternately races ahead of and falls behind Earth in its yearly trek around the sun, it ranges out to about 100 times the moon’s distance, then closes to as few as 38 lunar distances: from 38 million down to 14.7 million kilometers. Other asteroids make closer approaches to Earth, and can be reached with less rocket propellant. But what makes HO3 special is that it’s always around for a visit: It offers a launch opportunity every year for the next few decades. Other typical near-Earth asteroids offer only periodic, infrequent launch windows. 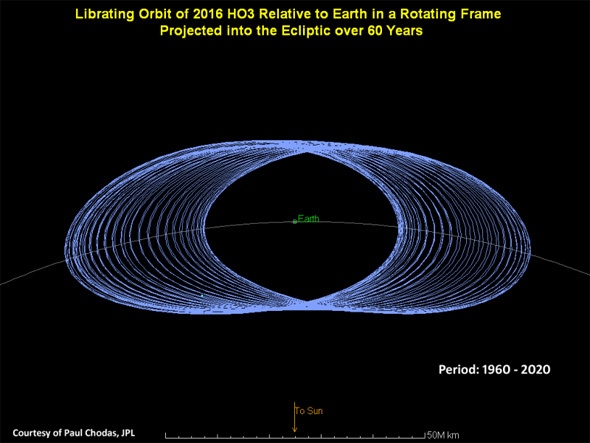 HO3’s discovery is a timely reminder to NASA that if it wants to get astronauts out beyond the moon in the 2020s or early 2030s, either HO3 or another attractive target is nearly always within range. HO3’s discovery resulted from NASA’s ongoing survey of the inner solar system for potentially hazardous objects. 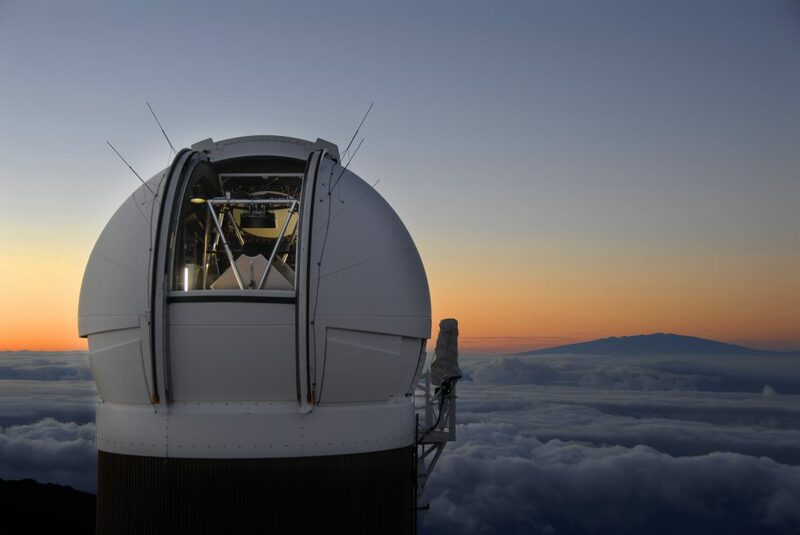 Since 1998, when Congress directed NASA to search for near-Earth objects such as comets and asteroids large enough to cause global damage if they struck Earth, the space agency has been funding a growing array of dedicated search telescopes and the astronomers who operate them. Today, the NASA search program’s $50 million annual budget covers search, orbit cataloging, asteroid deflection research and spacecraft mission definition. 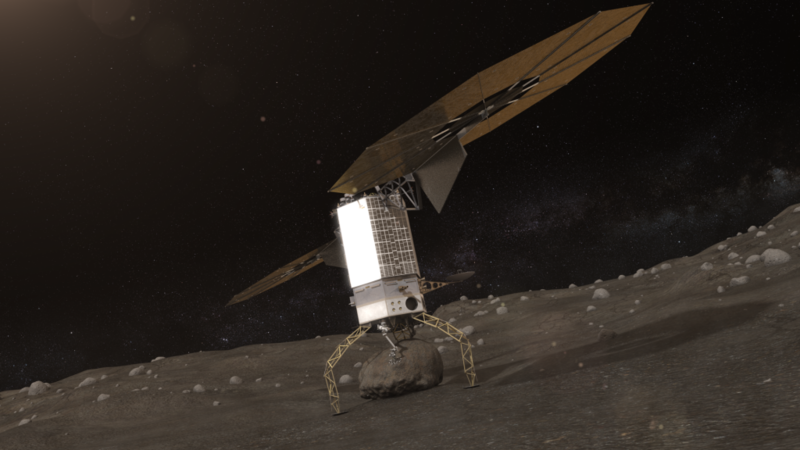 It also identifies candidate targets for NASA’s planned Asteroid Redirect Mission, ARM, in which robotic spacecraft would lift a 10- to 20-ton boulder from an asteroid and nudge the fragment into lunar orbit. Once stabilized there, an Orion astronaut crew would rendezvous with the object, examine it, and carry samples to Earth. Nevertheless, HO3’s loitering behavior makes it a regularly accessible exploration target: a launch window to it is always handy. In any given year, for example, a 154-day round trip to HO3 could be mounted for a total velocity change of roughly 12 kilometers per second. Stretching the mission duration to one-year reduces the velocity change to 6.1 kilometers per second–significantly less than landing that same spacecraft on the moon, which takes about 9 kilometers per second. 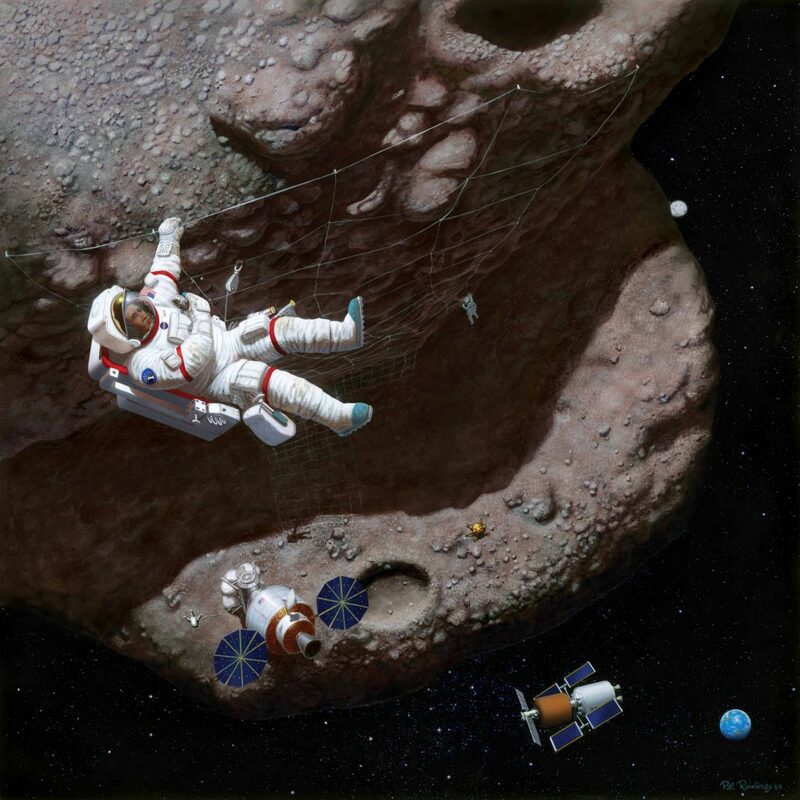 Both HO3 missions would include eight days of surface exploration time at the asteroid. Although far from the optimum candidate, HO3’s discovery in our celestial backyard keeps asteroids, along with the moon, in the conversation as targets for science, human exploration and possible commercial exploitation. It’s a timely discussion: If ARM does not win support in 2017 from a new administration and a skeptical Congress, near-Earth asteroids like HO3 represent the closest physical destinations for astronauts beyond the moon. By the mid-2020s, NASA should have flown its Orion spacecraft and SLS booster several times. By adding habitation and propulsion modules to Orion, NASA would then be able to dispatch astronauts to nearby objects like HO3. NASA is already conducting habitation module studies, and such extra living space could be available a decade from now for an asteroid roundtrip. But such a deep-space journey will still confront planners with many of the risks of a Mars expedition: radiation exposure, the effects of prolonged free-fall, and psychological isolation as Earth recedes to the size of Carl Sagan’s “pale blue dot.” Supply considerations are daunting, too: a crew of four would need to pack almost 2.5 metric tons of food for a one-year asteroid roundtrip. Still, an asteroid expedition would be less challenging in terms of time, distance, and logistics than the two-plus-year journey to the Martian moons and back. An NEA mission could offer NASA just the right-sized first step on the road to Mars. Author’s Note: NAMING ASTEROIDS–An asteroid’s initial designation is assigned by the Minor Planet Center following a formula based on the year of discovery, two letters and, if need be, further digits. 2016 HO3, for example, was discovered in 2016, in the second half of April (H), and was the 89th object discovered in the latter half of April (O3). 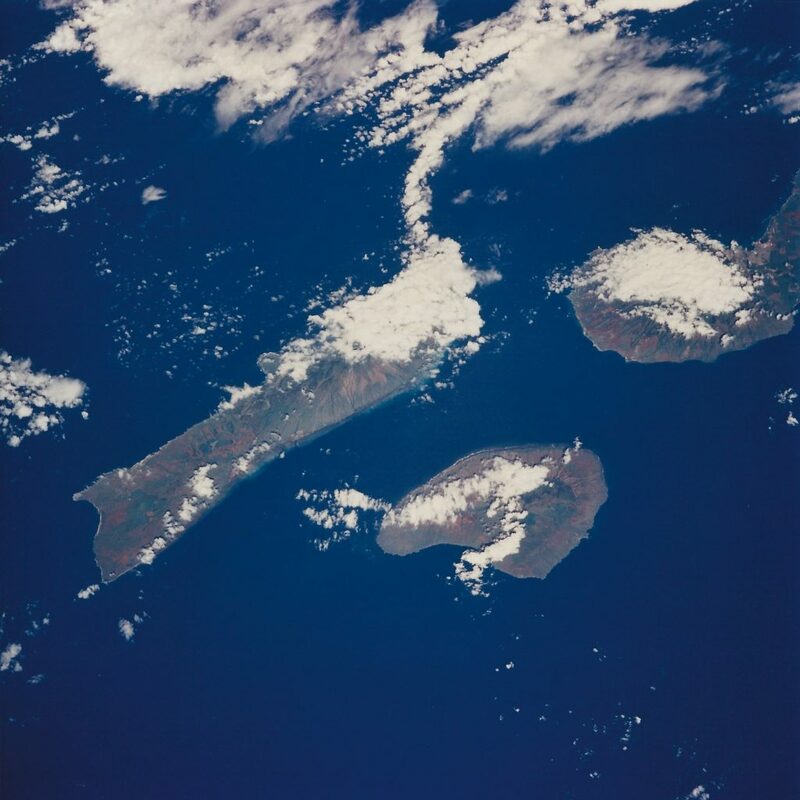 Our 100mm-lens Hasselblad photo of three of the Hawaiian islands was taken on Nov. 28, 1996 from an altitude of 190 nm (352 km). 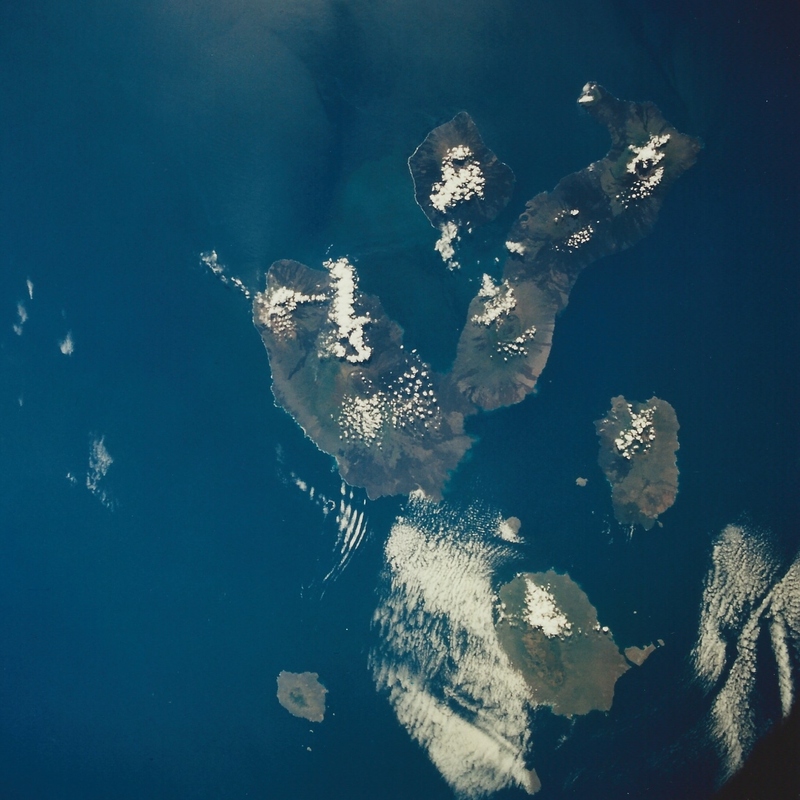 From Columbia, we noticed the clouds piled high on the windward side of Molokai (upper left), Lanai (center), and west Maui (upper right). Molokai’s highest point is 4970 feet, the summit of East Molokai volcano, the northern half of which slid into the sea in a titanic landslide. From the north shore, the projecting peninsula is a small shield volcano, the most recent eruption on Molokai, and the location of Kalaupapa, the site of a leper colony that operated from 1866 to 1969. Fr. Damien’s service there made the colony famous, and the community is now a national historical park. On the west end, the Papohaku Beach, a 3-mile long curve of golden sand, makes for an idyllic walk (been there, done that, and would still like to go back). 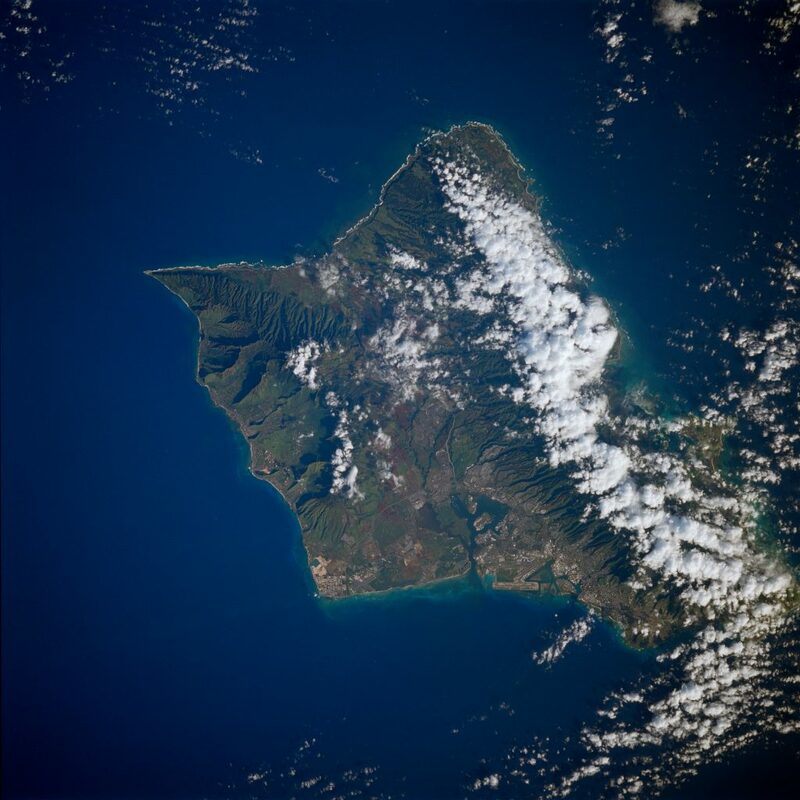 NASA says that Maui is the second youngest and second largest of the main Hawaiian Islands. Maui covers an area of 728 sq. miles (1886 sq. km). The island consists of two large volcanoes, West Maui (extinct, and visible here) and East Maui, (Haleakala) which last erupted in 1790. Lanai (near the center of the image), once owned by the Dole Pineapple Company, is the remnant of a volcano that is over one million years old. Lanai covers an area of 141 sq. miles (365 sq. km) and is 18 miles (29 km) long and 13 miles (21 km) wide. Molokai (situated north of Lanai) covers an area of 261 sq. miles (676 sq. km) and is 38 miles (61 km) long and only 10 miles (16 km) wide, with the west end being very dry. The Molokai channel west of Maui and between those two islands is also known as Lahaina Roads, a deep-water, protected anchorage that was once a regular anchorage for the U.S. Pacific fleet. The Japanese Pearl Harbor striking force reconnoitered Lahaina Roads on the morning of Dec. 7, 1941, and found it empty. Had the U.S. battleships been sunk in Lahaina Roads, salvage and repair in those deep waters would have been impossible. “Lucky” the fleet was in Pearl Harbor on that fateful morning. Our STS-80 Columbia crew took the above 100mm telephoto image of the Nabro volcano on Dec. 6, 1996. 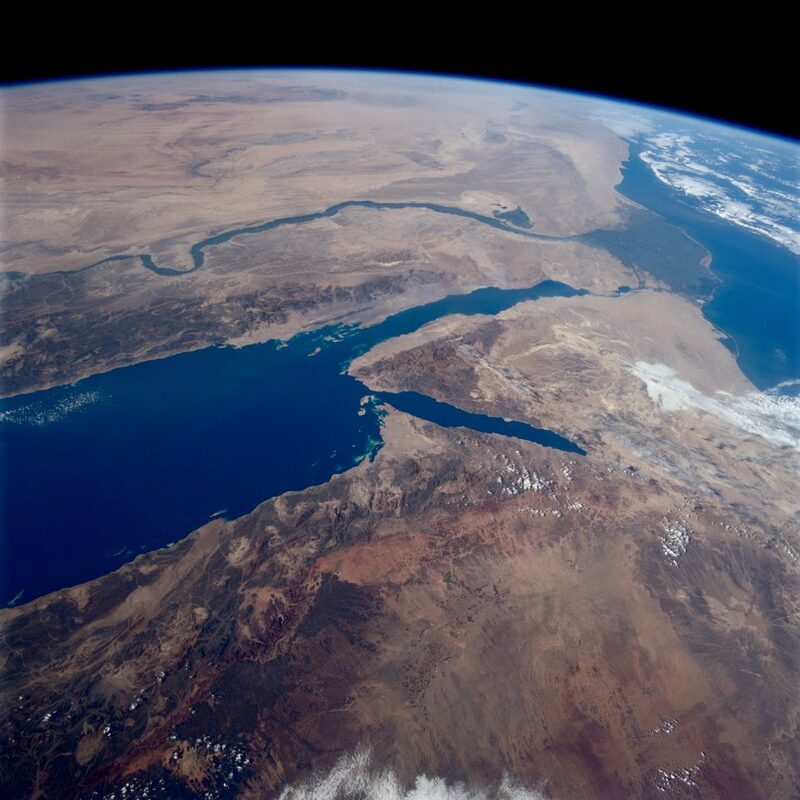 We were 187 nm (346 km) above the shores of the Red Sea near the Afar Triangle, where the Red Sea enters the Gulf of Aden. Nabro is a stratovolcano in the Southern Red Sea Region of Eritrea. It is located at the south-east end of the Danakil Alps in the Danakil Depression. Before its 2011 eruption, the volcano was widely believed to be extinct. North is at the top of this image. Its twin calderas are at lower left; the 7,721-foot mountain has erupted black, basaltic lava flows from its caldera and flanks. Part of the Afar Triangle, the Nabro Volcano is one of many volcanic caldera complexes in the northeasternmost part of the East African Rift valley region. The twin calderas likely formed during an eruption of about 20 to 100 cubic kilometres consisting of ignimbrite, although the date of their formation is unknown. Our Columbia crew was 187 nautical miles over the island of Hawaii, the Big Island, when we snapped this 250mm Hasselblad photo on Nov. 25, 1996. This view captures the summits of both of the island’s tallest volcanoes, Mauna Loa on the south (bottom), and Mauna Kea on the north, at right center with a tiny cluster of white clouds at its 13,803-foot (4207-meter) summit. In our view of the western half of Hawaii Island, volcanic smog from Kilauea (under the clouds to the right) swirls off the western shore, surrounding white clouds on the shoreline. Hualalai volcano, with a summit at 8,271 feet, is at center left in this photo, dotted by cinder cones on its flanks. The Kailua-Kona airport is visible at the western tip of the island, surrounded by Hualalai lava flows from the early 1800s. 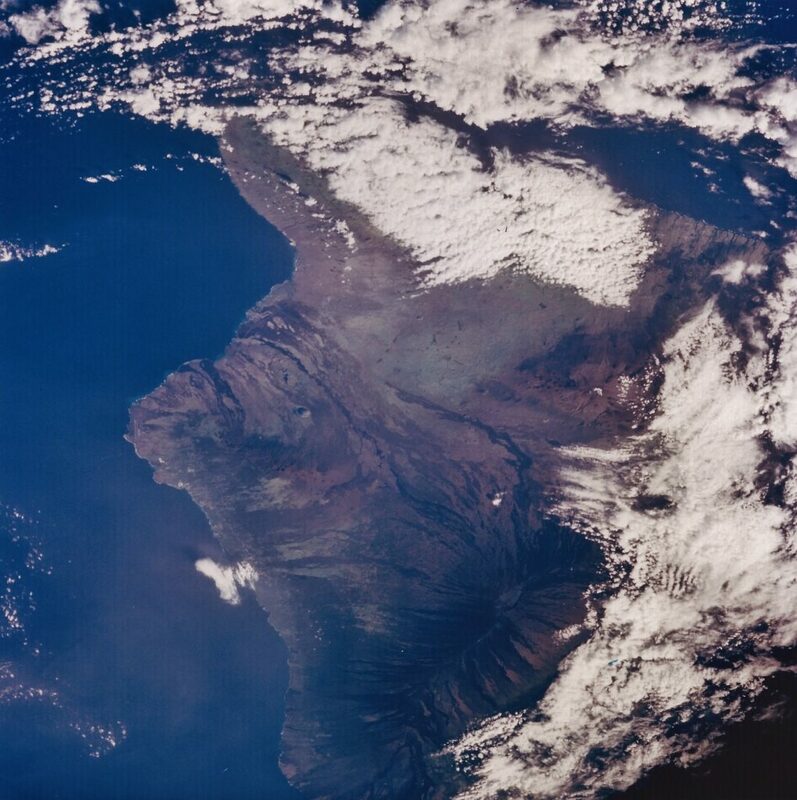 The Kohala peninsula, the oldest dormant volcano on Hawaii, stretches northwest, its windward coast under cloud cover. I particularly like this photo because under magnification, Mauna Kea’s summit (over 10,000 meters above the sea floor, and thus the world’s tallest mountain–but not the most massive) shows several of the observatories sited above most of the water vapor in the atmosphere. I used NASA’s Infrared Telescope Facility there in the late 1980s to search for water on asteroid surfaces. Mauna Loa, or “Long Mountain,” is a volcano located on the big island of Hawai’i and is part of the Hawaiian Island chain. It is the world’s largest active volcano rising 13,680 feet above sea level. It is a shield volcano with a volume of approximately 18,000 cubic miles…With its summit standing roughly 17 km (56,000 feet) above its base and its flanks covering about half of the Island of Hawai‘i, Mauna Loa is the world’s largest volcano. According to the U.S. Geological Survey, Mauna Loa’s peak rises roughly 4 km above sea level, its flanks slope downward another 5 km to the ocean floor, and then it is so massive it compresses the sea floor another 8 km! Mauna Loa has erupted more than 35 times since the island was first visited by westerners in the early 1800s. The large summit crater, called Mokuaweoweo Caldera, is clearly visible near the center of the image. Leading away from the caldera (towards top right and lower center) are the two main rift zones. Rift zones are areas of weakness within the upper part of the volcano that are often ripped open as new magma (molten rock) approaches the surface at the start of an eruption. The most recent eruption of Mauna Loa was in March and April 1984, when segments of the northeast rift zones were active. If the height of the volcano was measured from its base on the ocean floor instead of from sea level, Mauna Loa would be the tallest mountain on Earth. Its peak (center of the image) rises more than 8 kilometers (5 miles) above the ocean floor. The South Kona District, known for cultivation of macadamia nuts and coffee, can be seen on the left. North is toward the top. Mauna Loa presents a future hazard to the local towns of Hilo and Kona. The Kilauea volcano is located off to the right of Mauna Loa and is not visible in this image. 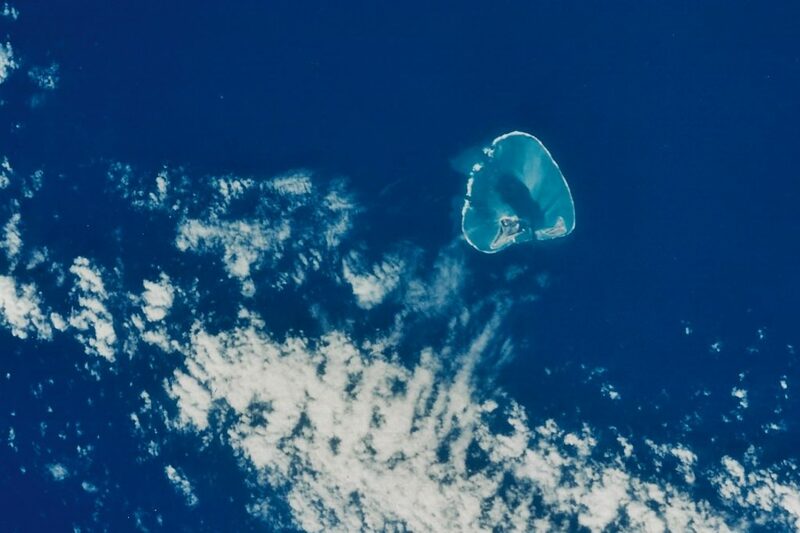 Like tiny pearls floating in a vast sea, the tiny islands and atolls of the North Pacific Ocean can be difficult to view from space as they sit in the deep blue expanse of the North Pacific Ocean. …Midway’s beautiful blue and silver coloration is not from the land mass, but from the coral reef ringing the island. At the highest resolution, the scant 6.2 square km of land appears tan. Sand Island is the largest island and sits to the west of second largest island in the atoll, Eastern Island. At its peak, the land only rises only 13 meters above sea level. Midway Atoll is just 150 miles east of the International Dateline, making it truly midway around the world from the Greenwich meridian. It sits on the far northern end of the Papahānaumokuākea Marine National Monument, and is the only atoll or island in the Hawaiian archipelago not part of the State of Hawaii. In 1988, Midway became a National Wildlife Refuge and is now administered by the U.S. Fish and Wildlife Service. The rich waters and bits of land that make up Midway Atoll provide a home for a wide variety of species. A complex community of invertebrates and coral reef fishes thrive in the protected lagoon and in the reefs. An estimated 3 million individual birds of at least 21 species nest on the tiny islands, filling nearly every square inch of available habitat. The beaches provide nursing grounds for the endangered Hawaiian monk seals, and a place for threatened green turtles to haul out for a much needed rest. On June 4, 1942, Midway was attacked by Japanese Admiral Yamamoto’s Imperial Combined Fleet in an attempt to lure the U.S. Navy’s aircraft carriers to their destruction. Japanese strike aircraft bombed the aircraft hangars, command post, and fortifications, but did not put the airfield out of operation (they hoped to capture it for their own use). During a desperate series of air battles, three U.S. carriers surprised the Japanese carrier striking force and sank all four of its fleet carriers by the end of the day. The U.S. Navy lost the carrier Yorktown to air and submarine attack, but the destruction of the Japanese fleet’s air striking arm forced its withdrawal, and marked the end of Japanese expansion in the Pacific. I urge the Fish and Wildlife Service will reopen this important site to tourism. (Added 12/6/18) East of Mt. 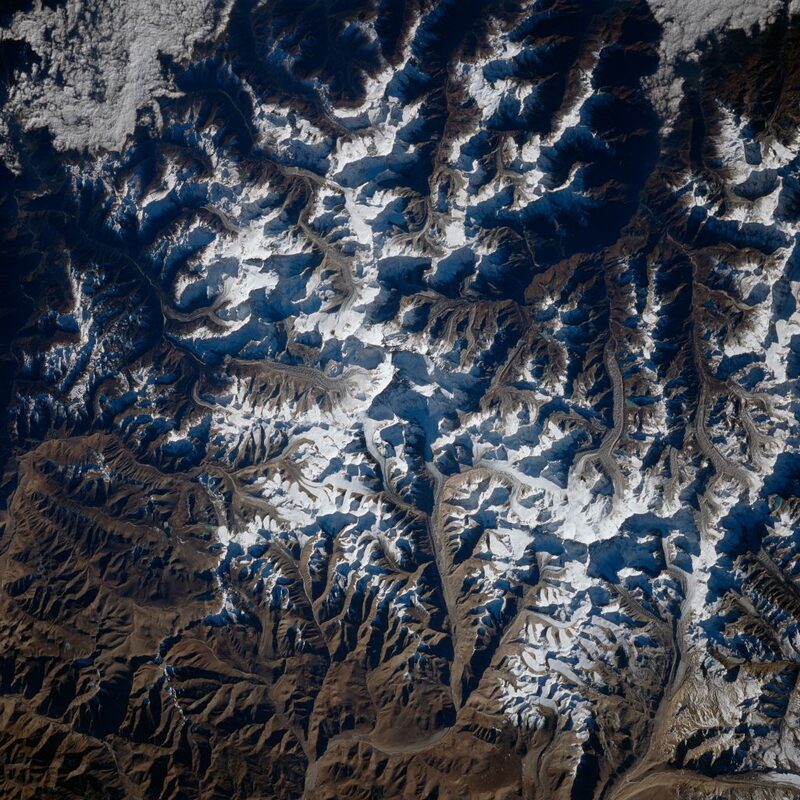 Everest near the borders of Tibet, Bhutan, and China, we on Columbia caught an early morning view of Jomolhari, at the center of our telephoto Hasselblad shot. Its long shadow is what caught my eye, as did the shadows thrown by this entire range. Adjacent to the right is the slightly lower peak of Jichu Drake, feeding a glacier stretching east. North is to upper right. Jomolhari reaches 24,035 feet MSL. That lake at right center is called Duoqing Co., and just to the southeast runs another line of jagged, saw-toothed peaks. What a vantage point we had! (Edited Dec. 5, 2018) Soaring eastward over the vast Sahara, we enjoyed repeated views of the exposed sands and bedrock of this arid region, laid bare by the lack of vegetation. Here is our crew’s 250mm Hasselblad telephoto shot of the Emi Koussi volcanic summit in Chad. 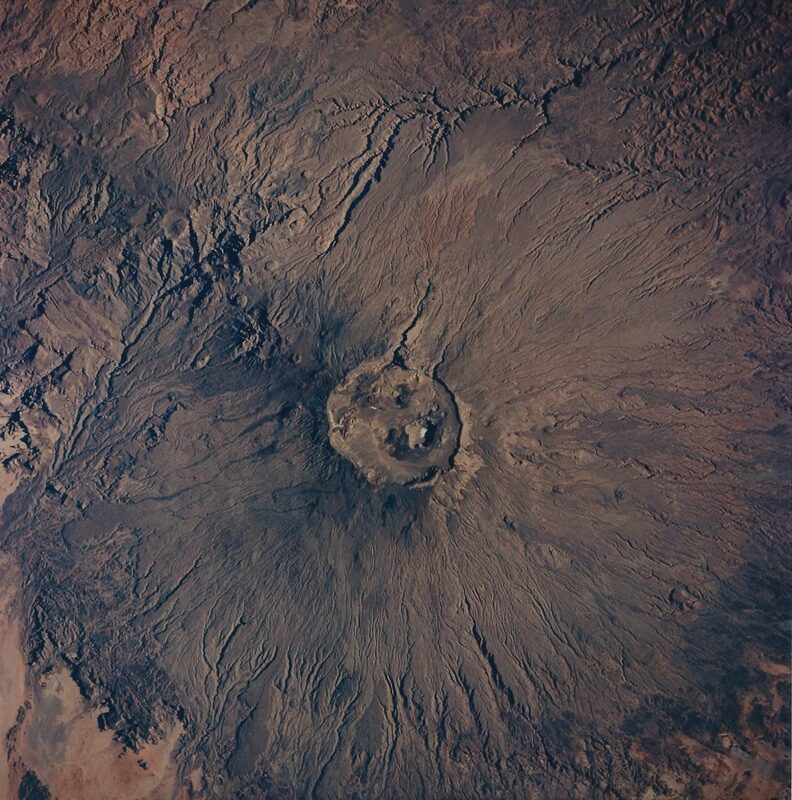 According to NASA, the broad Emi Koussi volcano is a shield volcano located in northern Chad, at the south-eastern end of the Tibesti Range. The dark volcanic rocks of the volcano provide a sharp contrast to the underlying tan and light brown sandstone exposed to the west, south, and east (image lower left, lower right, and upper right). This astronaut photograph highlights the entire volcanic structure. At 3,415 meters above sea level, Emi Koussi is the highest summit of Africa’s Sahara region. The summit includes three calderas formed by powerful eruptions. Two older and overlapping calderas form a depression approximately 12 kilometres by 15 kilometres in area bounded by a distinct rim (image centre). The youngest and smallest caldera, Era Kohor, formed as a result of eruptive activity within the past 2 million years. Although the volcano hasn’t erupted in recorded history, there are recent lava flows on the flanks of the mountain, and hot springs and fumaroles are still active at its foot. Emi Koussi reminds me of some of Mars’ ancient shield volcanoes. Mount Everest, near the border of Nepal and China, which reaches 29,028 feet in elevation (8,848 meters). STS080-733-001. My Key West entry comes 21 years after our STS-80 flight aboard Columbia: 18 days of complex satellite operations and maneuvers, coupled with outstanding opportunities for Earth photography. I’ve been to Key West several times; the city is now in the middle of its recovery from Hurricane Irma in 2017. 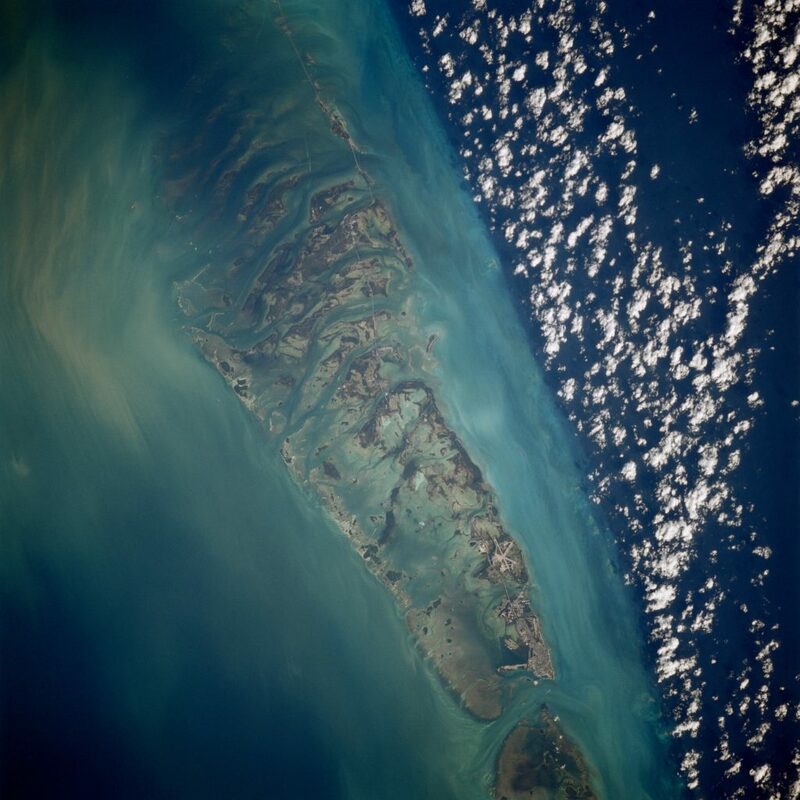 The Keys and their surrounding waters are one of an astronaut’s favorite terrestrial landmarks. Haven’t had my last visit to the Keys, or its fresh seafood restaurants and Cuban-style coffee. NASA caption: The view shows the city of Key West, bottom mid-right, with Marathon Key, near top middle left, and the edge of the Straits of Florida, the dark water on the right edge. Clouds form over the cooler waters of the strait. The runways at Boca Chica Key Naval Air Station are seen near Key West. The bottom can be seen clearly in the shallow water, the deeper water has depths of over a half a mile. The thin line of the Overseas Highway can be traced east from Key West. Prior to a hurricane in 1935, this route was a railway line. 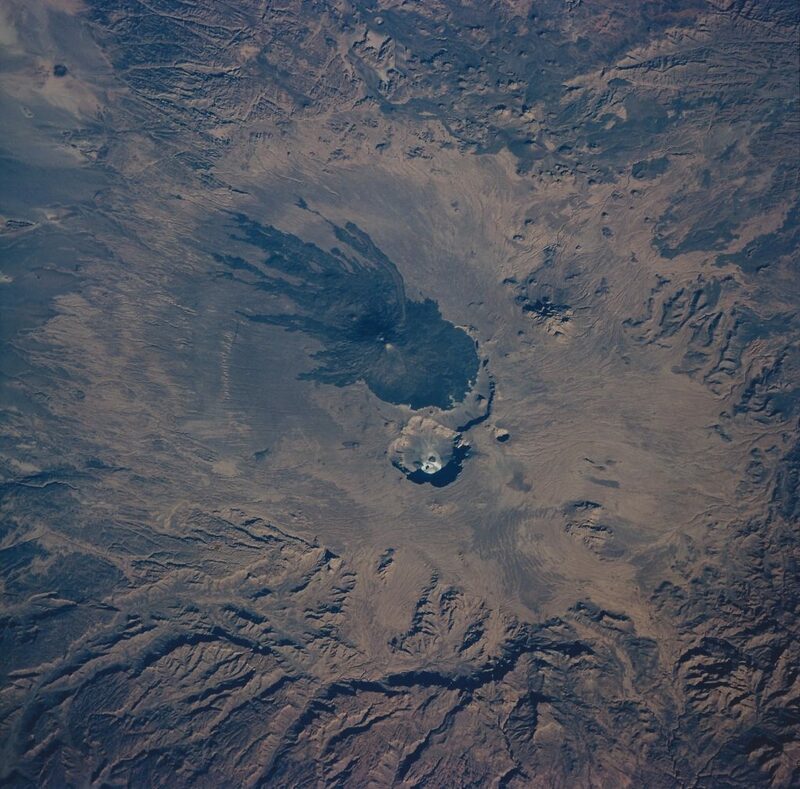 The Pic Tousside volcano on the Tibesti Plateau in northern Chad, photographed from STS-80, Columbia. (NASA sts080-722-13)Crossing the Sahara wastes in orbit on Columbia, our crew captured this view of the Pic Tousside volcano, using a 250mm lens on a Hasselblad 70mm film camera. The volcano is an eye-catching landmark on the way from Morocco to the Nile Valley. Note the numerous cinder cones at the top of the photo on the mountain slopes; the black basalt lava flows are running downhill, of course. The Tibesti Mountain Range in northern Chad is one of the world’s least-studied volcanic regions. A look at the area from space, however, must intrigue volcanologists. One of the Tibesti Mountain’s features is Tarso Toussidé. Looking like the result of a giant inkwell tipped on its side, Tarso Toussidé underwent a violent eruption in the recent geologic past, and the remains of that eruption have stained the ground black. The volcano ejected tephra, fragments of rock and volcanic glass, lava, and ash. Tephra does not last on the landscape as long as consolidated volcanic rocks such as tuff or lava, so the presence of tephra suggests fairly recent activity. In the middle of the field of dark tephra is Pic Toussidé, a lava dome poking out of the current caldera. Volcanoes often sport multiple calderas, particularly as the primary site for eruptive activity shifts over time. East of Pic Toussidé are two calderas, the southern one bearing a white splotch roughly 2 kilometers long. This white color could result from salt. Water pooling in the caldera would not have an outlet, and as the water evaporated, minerals such as salt would be left behind. 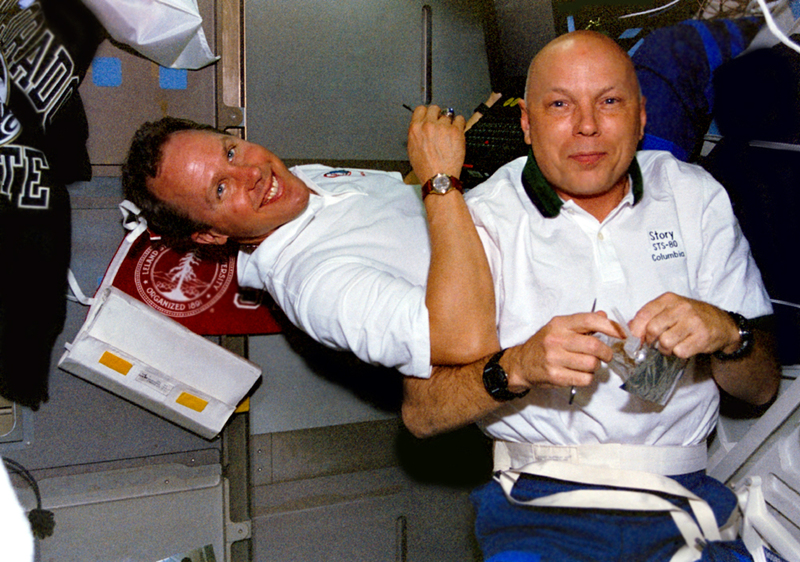 My Columbia crewmates and I took this shot on STS-80 with a 70mm Hasselblad film camera using a 100mm lens. On December 5, 1996, our altitude over the northeastern plains of India was about 185 nm. Master geologist and astronaut instructor Bill Muehlberger wrote the caption above; Bill helped teach the Apollo astronauts their geology skills, and he took my Hairball astronaut class to the field in New Mexico to teach similar lessons. At the southern base of the Himalaya (bottom center) is the Brahmaputra River, flowing from east to west (right to left) on its way to join the Ganges. The Brahmaputra River (also called as “Burlung-Buthur” by the Bodo people of Assam), called Yarlung Tsangpo in Tibetan language, originates on the Chemayungdung Glacier located on the northern side of the Himalayas in Tibet. The river is 3,848 km (2,391 mi) long. The river flows around and through the eastern ranges of the Himalaya and returns in the lower part of the photo, flowing to the west, to join the Ganges. 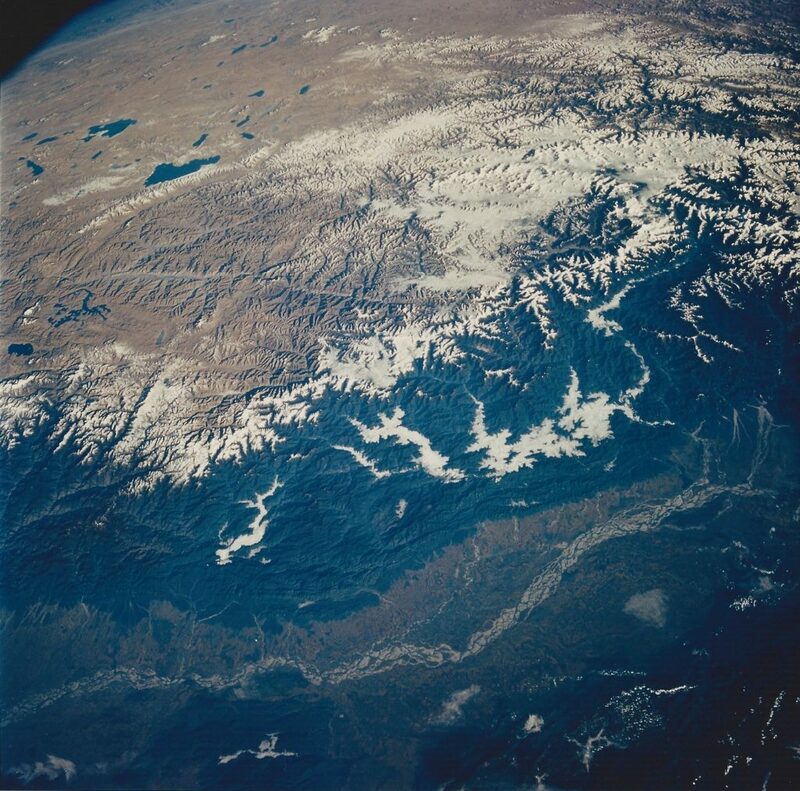 The Tibetan Plateau is the tan area at upper left. The spidery lake at left edge of the photo is Yamzha Yumco. Lhasa, Tibet lies just to the north. The Jiali tectonic fault slashes across Tibet from upper left to right. 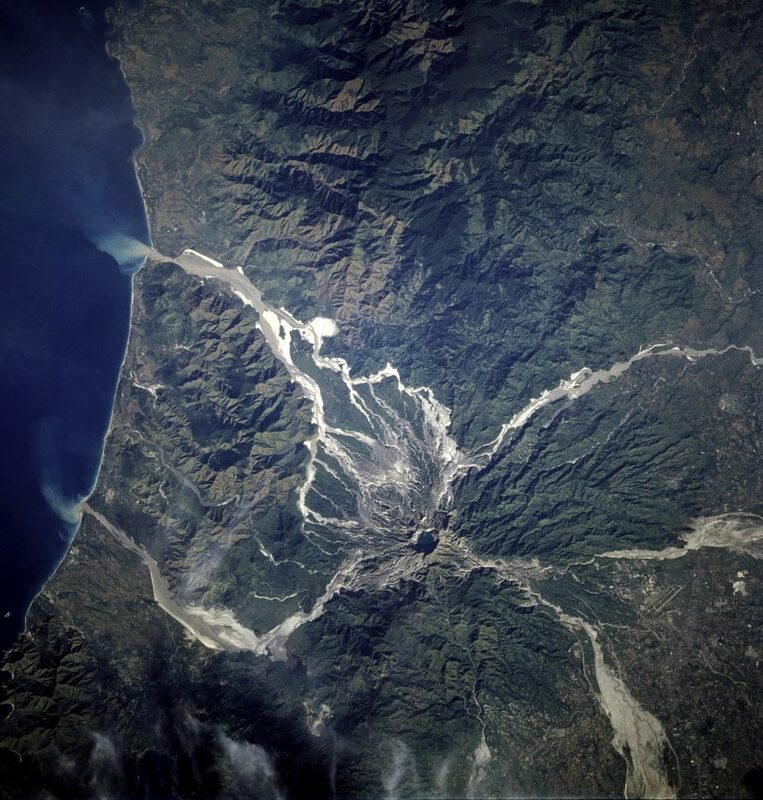 At far right center, the Brahmaputra emerges from the mountain front and carries an immense load of silt and sand toward the Bay of Bengal in the Indian Ocean. Geologists estimate that the Brahmaputra transports approximately 13 million tons of suspended sediment per day during floods. This is one corner of the world where erosion is tearing the Himalaya down almost as fast as they are pushed skyward. 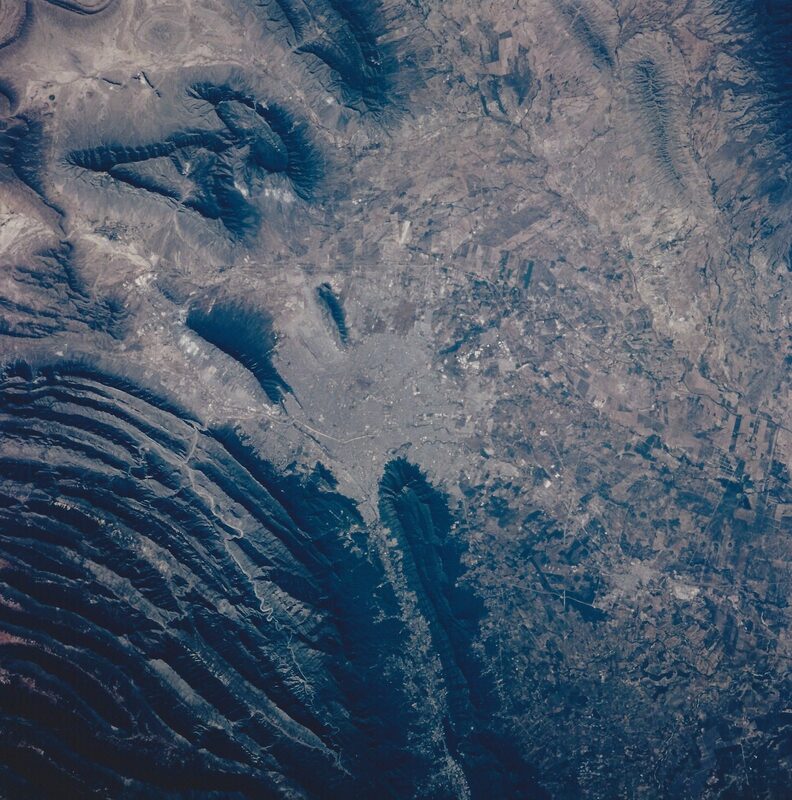 This STS-80 Columbia image, shot with a 250mm lens on a Hasselblad 70mm body, shows one of our favorite Sahara targets, the Aorounga impact crater, which may be a chain of 3 circular impact craters. 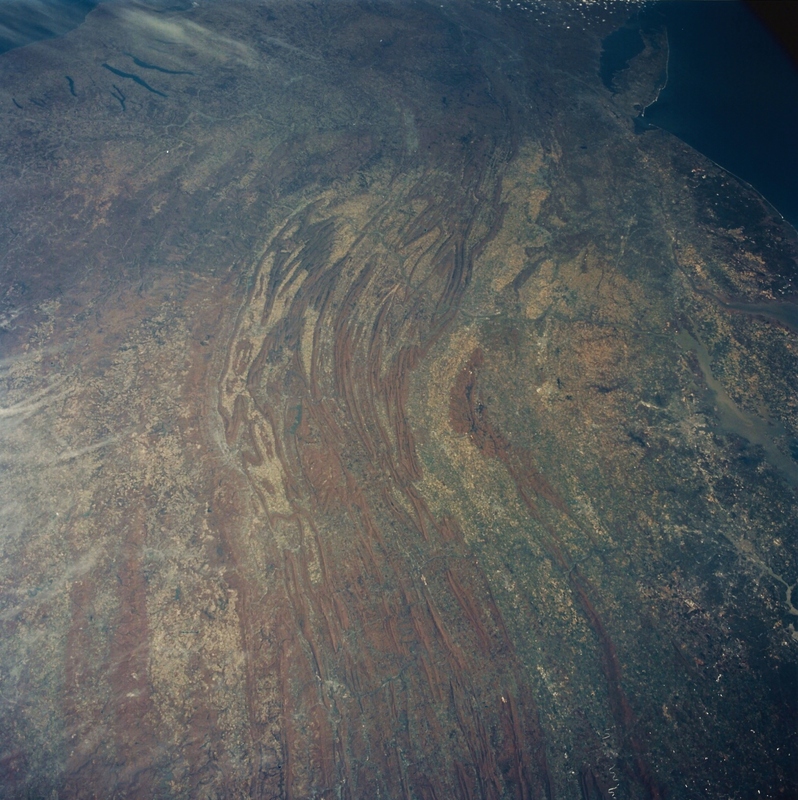 Radar images from STS-59, Space Radar Lab 1 (April 1994, my first mission), revealed what looks like two smaller craters to the northeast. This entire frame is about 25 miles across. From NASA’s Earth Observatory: Aorounga Impact Crater is located in the Sahara Desert, in north-central Chad, and is one of the best-preserved impact structures in the world. The crater is thought to be middle or upper Devonian to lower Mississippian (approximately 345–370 million years old) based on the age of the sedimentary rocks deformed by the impact. Spaceborne Imaging Radar (SIR) data collected in 1994 suggests that Aorounga is one of a set of three craters formed by the same impact event. The other two suggested impact structures are buried by sand deposits. The concentric ring structure of the Aorounga crater—renamed Aorounga South in the multiple-crater interpretation of SIR data—is clearly visible in this detailed astronaut photograph. The central highland, or peak, of the crater is surrounded by a small sand-filled trough; this in turn is surrounded by a larger circular trough. Linear rock ridges alternating with light orange sand deposits cross the image from upper left to lower right; these are called yardangs by geomorphologists. Yardangs form by wind erosion of exposed rock layers in a unidirectional wind field. The wind blows from the northeast at Aorounga, and sand dunes formed between the yardangs are actively migrating to the southwest. 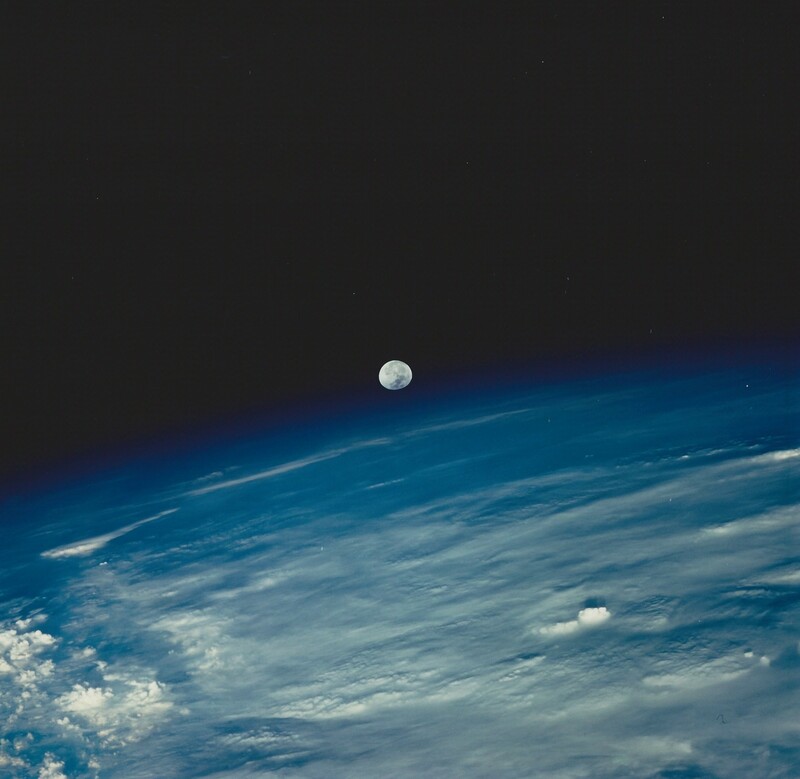 We took this image from Columbia on November 24, 1996, from an altitude of 188 nautical miles. Mount Pinatubo is an active stratovolcano on the island of Luzon, in the Philippines. On all my flights (which all came after the 1991 eruption), I’ve observed the downhill migration of volcanic ash from the summit and its crater lake. The crater lake and mud flows are seen very well here, after the 1996 monsoon season. Note the now-closed Clark Air Force Base (and now reopened commercial airport) on the plains at lower right. From Wikipedia: Before 1992, Pinatubo was heavily eroded, inconspicuous, and obscured from view. It was covered with dense forest which supported a population of several thousand indigenous Aetas people. The volcano’s eruption on June 15, 1991 produced the second largest terrestrial eruption of the 20th century (after the 1912 eruption of Novarupta in the Alaska Peninsula). Complicating the eruption was the arrival of Typhoon Yunya (Diding), bringing a lethal mix of ash and rain to areas surrounding the volcano. Predictions at the onset of the climactic eruption led to the evacuation of tens of thousands of people from the surrounding areas, saving many lives. Surrounding areas were severely damaged by pyroclastic flows, ash deposits, and, subsequently, by the lahars caused by rainwaters re-mobilizing earlier volcanic deposits. This caused extensive destruction to infrastructure and changed river systems for years after the eruption. The volcano’s Plinian / Ultra-Plinian eruption on June 15, 1991 produced the second largest terrestrial eruption of the 20th century after the 1912 eruption of Novarupta in the Alaska Peninsula. Complicating the eruption was the arrival of Typhoon Yunya (Diding), bringing a lethal mix of ash and rain to areas surrounding the volcano. Predictions at the onset of the climactic eruption led to the evacuation of tens of thousands of people from the surrounding areas, saving many lives. Surrounding areas were severely damaged by pyroclastic flows, ash deposits, and, subsequently, by the lahars caused by rainwaters re-mobilizing earlier volcanic deposits. This caused extensive destruction to infrastructure and changed river systems for years after the eruption. NASA text by my colleague, volcanologist Dr. Cindy Evans: In early 1991, Mt. Pinatubo, a volcano north of Manila on the Philippine island of Luzon, had been dormant for more than 500 years. Few geologists would have guessed that it would produce one of the world’s most explosive eruptions in the twentieth century. Indications of unrest started a few months before the June 1991 eruption, but the size and impact of the eruption were completely unexpected. During the June 12-15 eruptive climax, the top of the mountain was blown off, lowering the elevation by roughly 150 m. About 8 to 10 km2 of material (Scott, et al., 1996) spewed out of the volcano onto the surrounding slopes. The eruption forced evacuation of more than 50,000 people, and effectively shut down two major US military bases (Clark Air Force Base and Subic Bay Naval Base); it was ultimately responsible for taking several hundred human lives. Before the eruption, Mt. Pinatubo was a forested, deeply dissected and unimposing mountain on Luzon’s Bataan Peninsula. Although the upper slopes were steep and not well suited for agriculture, the lower slopes were heavily populated and supported extensive rice fields. During the eruption, the upper slopes of the mountain suffered immediate destruction. The climactic explosions of June 14–16, 1991, blasted away the summit of Pinatubo, blew down surrounding forests, and rained hundreds of cubic meters of loose sand and gravel down on the mountain’s upper slopes. Floods of hot volcanic slurries were responsible for long-lasting damage downslope. Astronauts did not observe the June 1991 eruption of the volcano—but they have routinely monitored subsequent changes around Mt. Pinatubo. The eruption had two major environmental effects which are readily documented from low-Earth orbit: the distribution of vast quantities of sulfur dioxide aerosols into the stratosphere; and the post-eruption mudflows, or lahars, which are recognized as the major natural hazard from the eruption. 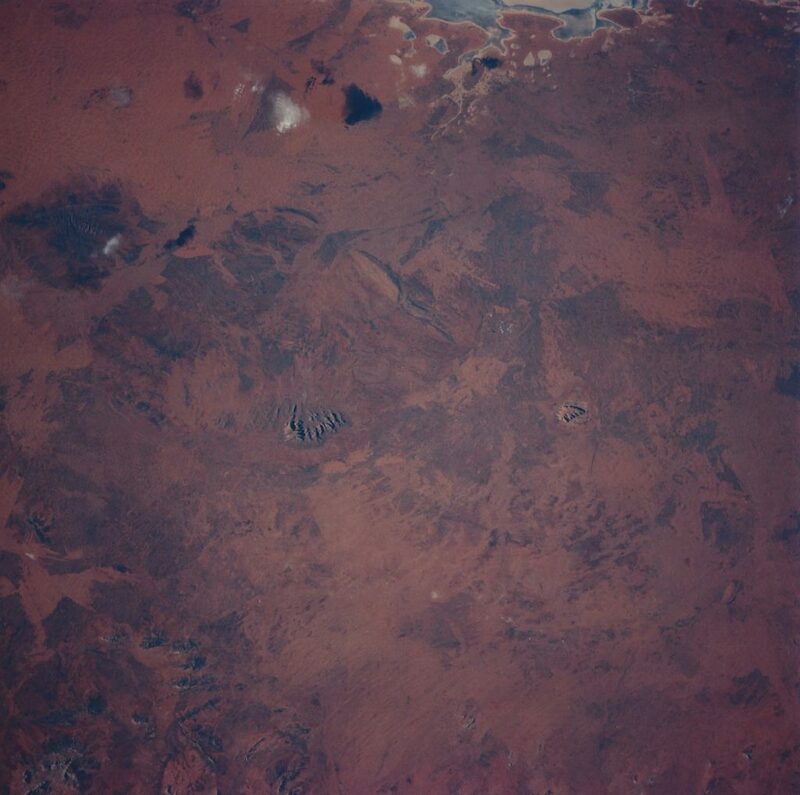 This image of Ayers Rock and the Olgas (Uluru and Kata Tjuta) and the surrounding terrain was captured by the crew of space shuttle Columbia during the STS-80 mission; it was taken on Dec. 6, 1996, from an altitude of 202 nautical miles. We always looked for a chance to shoot Uluru on our passes over Australia, and this was a particularly nice pass, captured with a 100mm Hasselblad lens on 70mm film. 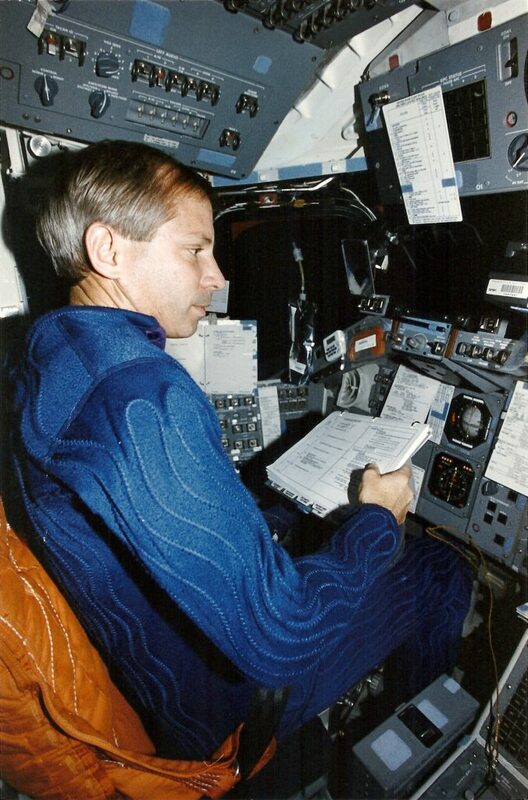 I trained for both my Space Radar Lab missions at Ayers Rock and the Olgas with a NASA team flying the agency’s DC-8 aircraft out of nearby Alice Springs. 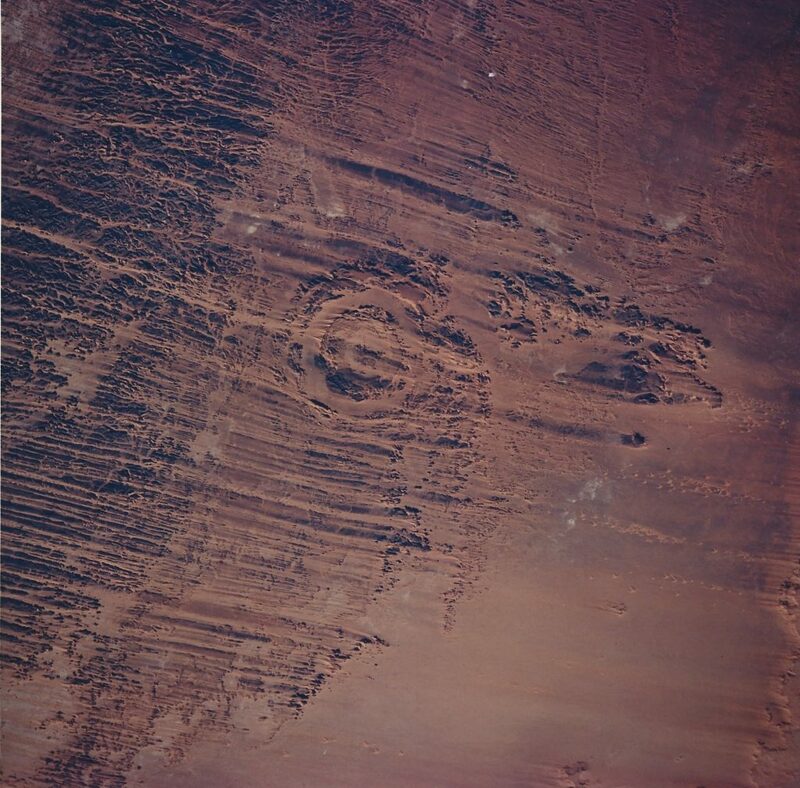 Fellow STS-59 astronaut Linda Godwin and I drove 5 hours from Alice Springs to visit these famous rock formations. In this image, Uluru is at right, with Kata Tjuta and its highest promontory, Mt. Olga, on the left. Lake Amadeus is at top. From NASA’s “Visible Earth” website: Seen from ground level, this majestic sandstone rock formation stands 348 meters (1,120 feet) tall and is 3 kilometers (1.85 miles) long. Uluru is the ancient name used by Indigenous Australians; Ayers Rock is the name that was given to the landform by explorer William Christie Gosse in the 1800s. Uluru is one of Australia’s major tourist attractions (more than 270,000 visitors in 2014), with operations run by people from the small town of Mutitjulu. A 16-kilometer (10-mile) road circles the rock, and a disused airstrip lies near the town. Uluru and a similar striking landform known as Kata Tjuta (Mount Olga) are part of the Uluru-Kata Tjuta National Park, created as a UNESCO site in 1994 for cultural preservation and protection. Uluru and Kata Tjuta are remnants of sediments eroded from an ancient mountain range that existed about 550 million years ago. The sediments were subsequently buried and compressed to form harder rocks—called arkose and conglomerate by geologists. These rocks were later tilted from their original horizontal orientation by powerful tectonic forces. Views from above now clearly show the hundreds of originally flat-lying layers that make up Uluru. Softer and younger sedimentary rocks were then eroded away, leaving the more resistant rocks exposed to form the present-day landforms. Uluru is thought by native peoples to have been created by ancestral beings during the Dreamtime, which has been described as the essence of aboriginal culture and spirituality. The rock is regarded as one of the ancestors’ most impressive pieces of work. Ancient paintings throughout its caves and fissures describe this relationship, keeping Dreamtime traditions alive. The proximity of the Mutitjulu settlement to the rock symbolizes the spiritual connection between the local people and Uluru. From NASA’s Earth Observatory website: In the heart of the Australian Outback, a massive block of red sandstone rises up out of the near-perfect flatness of the eroded landscape. Called Uluru, or Ayer’s Rock, this giant is a monolith 348 meters (1,142 feet) high, 3.6 kilometers (2.2 miles) long, and 9.4 kilometers (5.8 miles) around. It is the largest single rock known in the world. Tourists come from all over the country and the world to watch sunrise and sunset bring the colors of the rock to life. Centered in the scene, Uluru appears a more subdued orange-red than the surrounding desert soils. These reddish soils and their location in the heart of the Outback give rise to the region’s nickname as Australia’s “Red Center.” Trees and other vegetation surround the base of the rock, giving the impression of streams of turquoise waters flowing out of the rock. The rock is carved and scoured by eons of erosion by wind and water. To the Aboriginal people, many of these features are part of the religious mythology through which they describe their existence and history in the region. …Located in the Northern Territory of Australia, Uluru-Kata Tjuta National Park hosts some of the world’s most spectacular examples of inselbergs, or isolated mountains. The most famous of these inselbergs is Uluru (also known as Ayers Rock). An equally massive inselberg located approximately 30 kilometers (20 miles) to the northwest is known as Kata Tjuta. Like Uluru, this is a sacred site to the native Anangu or Aboriginal people. An English-born explorer named the highest peak Mount Olga, with the entire grouping of rocks informally known as “the Olgas.” Mount Olga has a peak elevation of 1,069 meters (3,507 feet) above sea level, making it 206 meters (676 feet) higher than Uluru. Kata Tjuta is comprised of gently dipping Mount Currie Conglomerate, a sedimentary rock that includes rounded fragments of other rock types (here, primarily granite with less abundant basalt and rhyolite in a coarse sandy matrix). Geologists interpret the Mount Currie Conglomerate as a remnant of a large fan of material rapidly eroded from mountains uplifted approximately 550 million years ago. Subsequent burial under younger sediments consolidated the eroded materials to form the conglomerate exposed at the surface today. 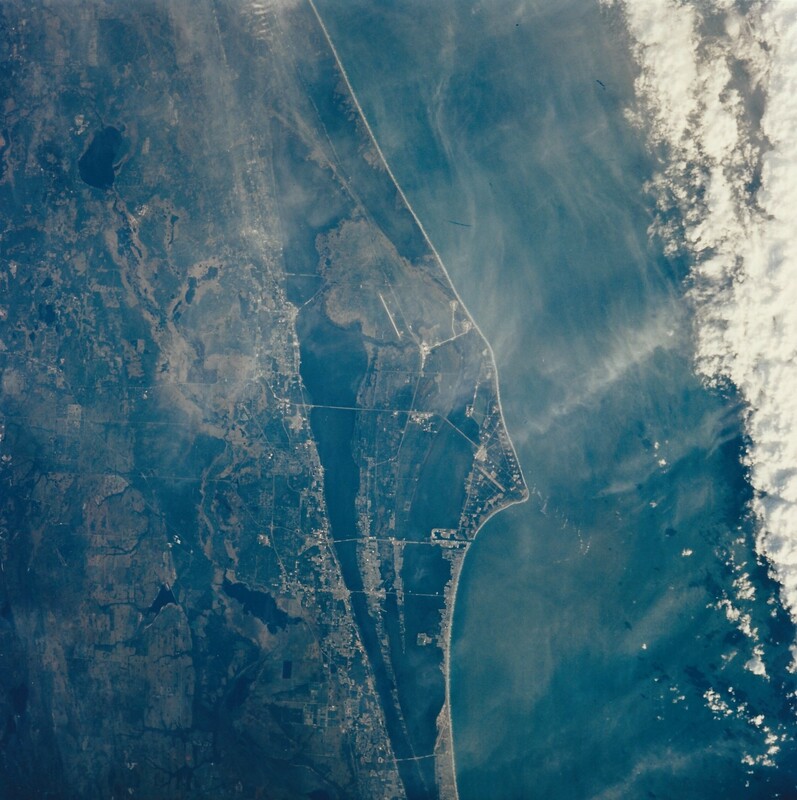 Runways of the shuttle landing facility (top center) and Cape Canaveral Air Force Station’s “Skid Strip” (near the tip of Cape Canaveral) are visible. At top center are the shuttle launch pads, 39A and 39B; we launched from Pad 39B (northernmost/topmost pad). Indian River is at left, the Banana River at right, next to the Cape. The old ICBM Row launch pads (Mercury and Gemini) are clearly visible north of Cape Canaveral. I left Earth four times from this place–pretty special. Monterrey is the capital and largest city of the northeastern state of Nuevo León, in Mexico. The city is anchor to the third-largest metropolitan area in Mexico and is ranked as the ninth-largest city in the nation. Monterrey is located in northeast Mexico, at the foothills of the Sierra Madre Oriental. Monterrey Image Caption (NASA): Potrero Garcia and Potrero La Mula are breached salt-cored folds immediately north of the Sierra Madre Oriental and Monterrey. [Portrero Garcia is the triangular formation at upper left.–TJ] Individual limestone layers can be resolved in this beautifully detailed view, as can the tilt of the layers outward from the center of the fold (anticline). Most of the salt has been eroded from the core of the structure, but what remains is now being mined. In Las Grutas de Garcia (Garcia Caverns) the limestone bedrock has been dissolved and both limestone and gypsum formations decorate the cave. 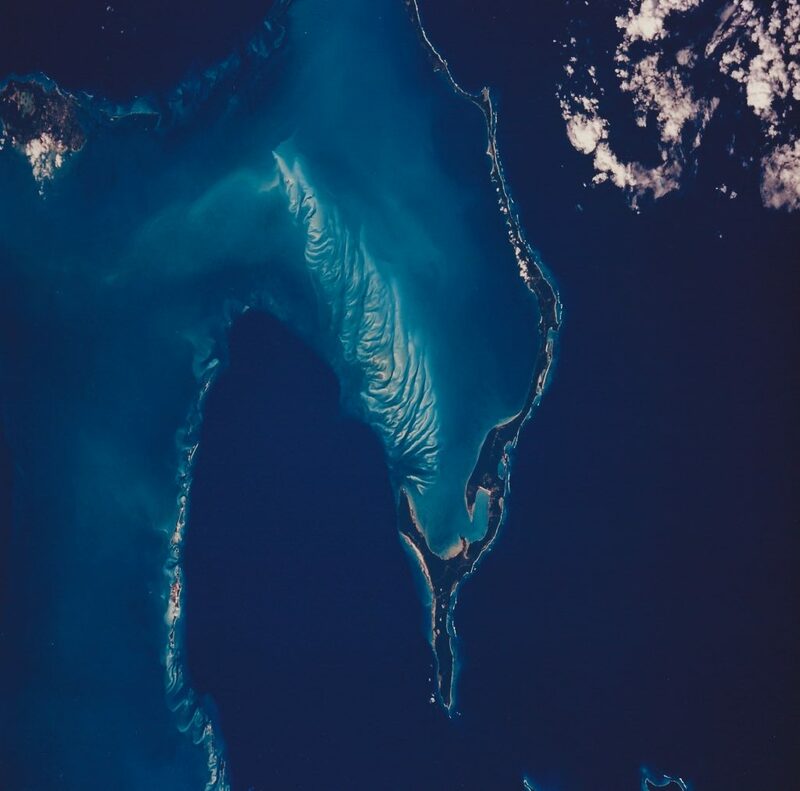 Our STS-80 crew took this shot of Great Exuma Island and the Tongue of the Ocean on Dec. 3, 1996, from 185 nautical miles above the Bahamas. This is one of the loveliest ocean areas visible to orbiting astronauts. A NASA caption says: This extraordinary image captures the meeting place of the deep waters of the Tongue of the Ocean and the much shallower, completely submerged Grand Bahama Bank. This platform reef drops off quickly into the branch of the Great Bahama submarine canyon that because of its shape is called the Tongue of the Ocean. The vertical rock walls of the Canyon rise 14,060 feet from their greatest depth to the surrounding seabed, which is why the water is so dark in color compared to the reef. The shallowest parts of the reef are no more than three to seven feet deep; so shallow, in fact, that in the northeast corner of the image you can zoom in and see large wave-sized ripples of sand on the bottom. Like so many other biological structures, the ribbon-like form of the reef maximizes surface area and thus the number of organisms that can colonize the structure. 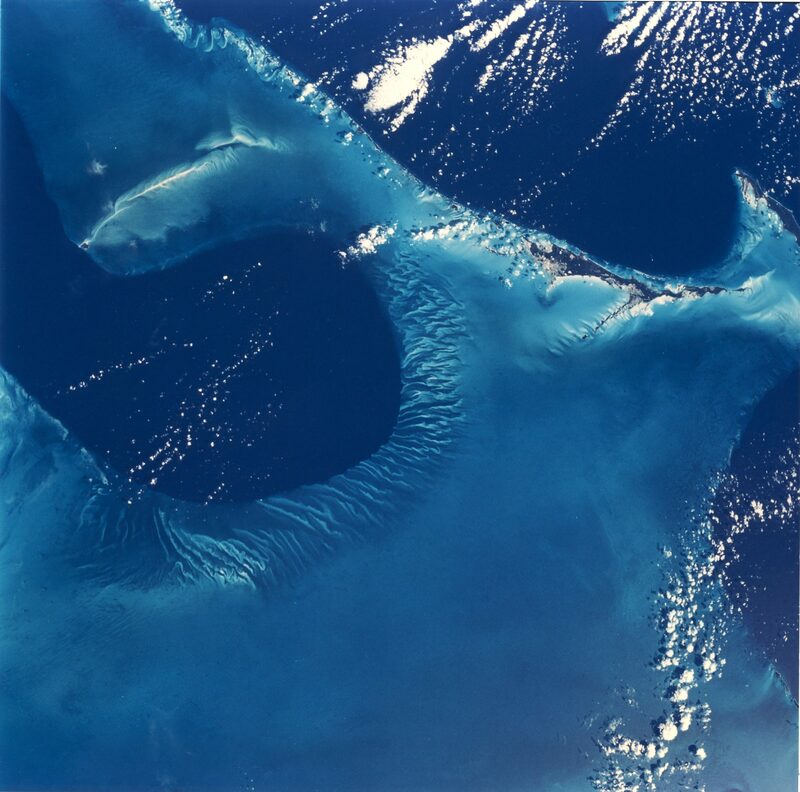 The closest land is the Bahama Islands of Great Exuma, less than 16 miles to the east [right side of the image], and Andros about 27 miles to the west. Another look at the Bahamas, this time Eleuthera Island. We were always captivated by the deep, indigo waters of the abyss surrounding the calcium carbonate coral sands of the shallows surrounding the islands. I hope to stand someday on an Eleuthera beach. 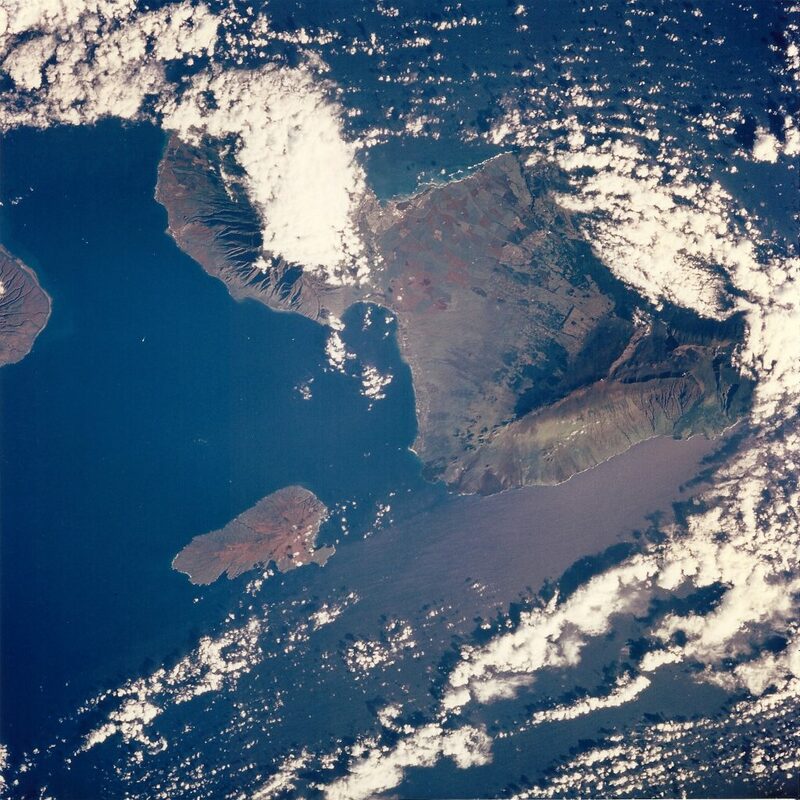 From 187 nautical miles up, our Columbia crew imaged the island of Maui and Kahoolawe (lower left) on Nov. 25, 1996. Lanai is to the far left. The West Maui volcano is under clouds, but the sharply incised ravines running down to Lahaina and Kanaapali Beach show how much rainfall the mountain intercepts. Central Maui is clear, as are the resorts along the west-facing South Maui coast. Kahului airport is visible on the north central coast. The green slopes of Haleakala volcano (dormant) are visible at right. Haleakala National Park includes the volcano’s summit, at about 10,000 feet. A line of cinder cones follows the southwest rift zone up to the summit; darker, more recent lava flows mark the site of the most recent eruption on Maui, just before 1800 on the southwest tip of the island opposite Kaho’olawe. Haleakala’s summit caldera has been heavily eroded by heavy rains, creating a wide summit valley that drains both to the south, north, and east. …There is less vegetation in the valley—which comprises much of the national park—than to the north and east of the mountain because the valley lies in a rain shadow. Prevailing winds drop rain on the eastern and northern sides of the mountains because moisture gets squeezed from the air as it flows up and over the slopes. The cinder cones—steep conical hills around volcanic vents—appear as small mounds in the middle of the valley. While London was correct that the lava flows are young, his time scale was a bit off. According to the U.S. Geological Survey, radiocarbon dating suggestions that the most recent eruption occurred between 1480 and 1600. The oldest exposed flows are 1.1 million years old, though geologists think the shield volcano began building itself up about two million years ago. Haleakalā National Park was created on August 1, 1916, as part of Hawaii National Park. At that time, the park also included Kilauea and Mauna Loa. However, in 1961, the volcanoes of Hawaii and Maui were separated into different parks. The name Haleakalā is Hawaiian for “House of the Sun.” In Hawaiian mythology, a god named Maui climbed the mountain and lassoed the Sun’s rays to lengthen the day. 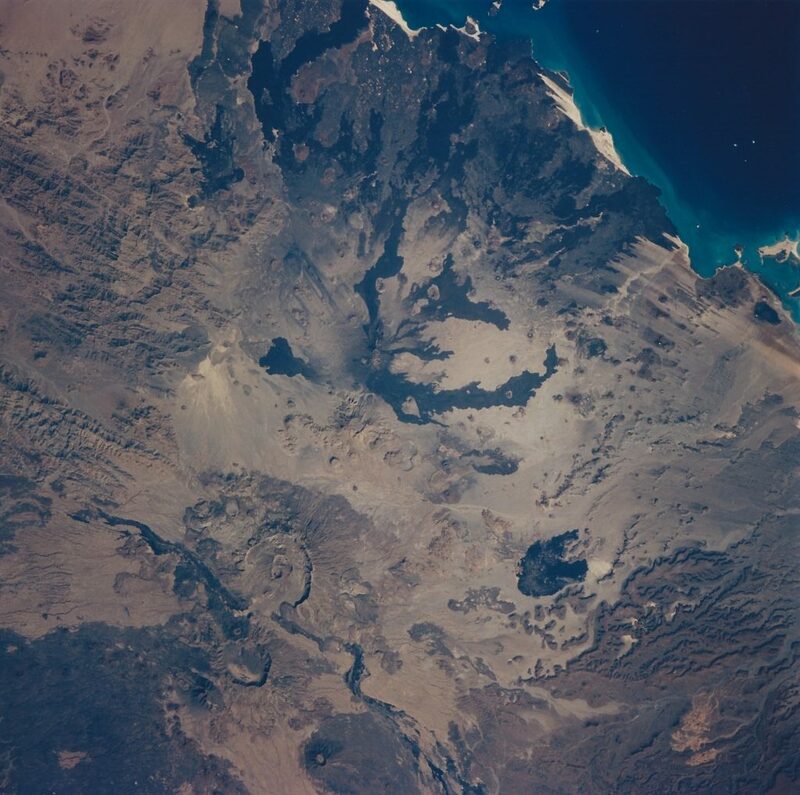 Our photo from STS-80 shows the lower tip of the Sinai Peninsula in Egypt. Mt.Sinai is just to the right of upper center amid a welter of crustal faults. Mount Sinai is a 2,285-metre (7,497 ft) moderately high mountain near the city of Saint Catherine in the Sinai region. It is next to Mount Catherine (at 2,629 m or 8,625 ft, the highest peak in Egypt). It is surrounded on all sides by higher peaks of the mountain range. (Wiki) North is at top right. From NASA’s caption: Low sun angle and excellent focus reveal details of three prominent sets of faults and fractures (and subordinate ones) in the 500-600-million-year-old bedrock of the Sinai Peninsula. 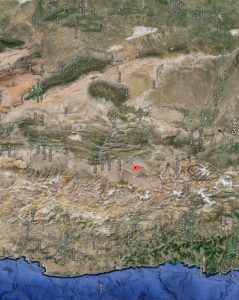 Displacement as great as 4000 m is documented on faults in the southwest. Younger, more northerly faults crosscut those of northeasterly and northwesterly trend; the younger faults reflect a change in the direction of extension in the Red Sea rift from NE (55 degrees) at ~25 million years ago to almost N (10-20 degrees) at present. 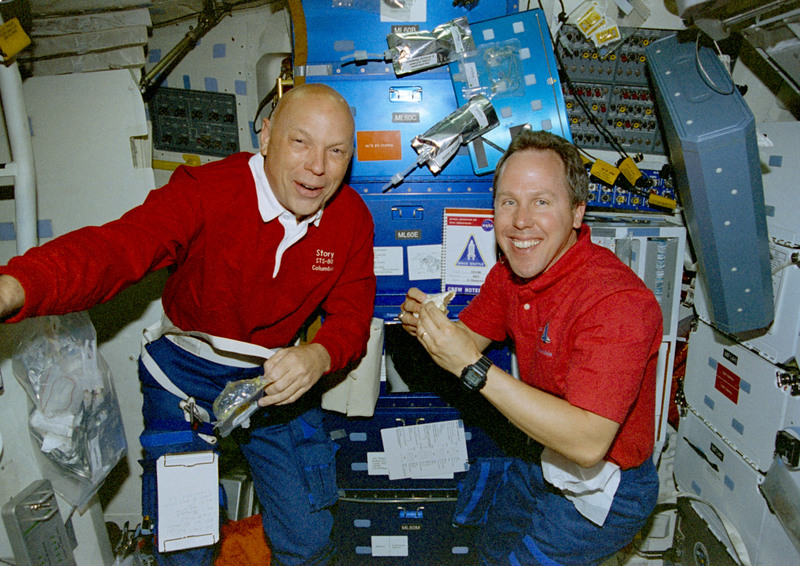 When our two spacewalks were cancelled on STS-80 due to a jammed hatch, we were at least partially compensated with two loosely scheduled days in our flight plan. We took full advantage of our Earth viewing opportunities and captured scenes like the one above. “Serenity” would be a good adjective for the feeling evoked by memories of this view. 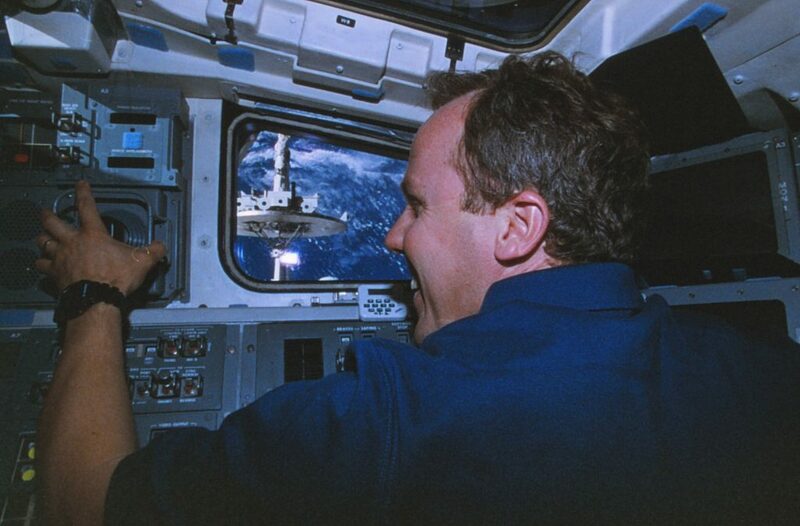 NASA’s caption reads: STS080-759-075 (19 Nov.-7 Dec. 1996) — This 70mm handheld camera’s panoramic view was photographed by the STS-80 crewmembers to capture the aesthetic side of space travel. The scene was in the South Pacific Ocean southwest of Hawaii and west of Christmas Island. The viewing angle from the space shuttle Columbia and the sunglint phenomenon gives the picture an almost three-dimensional effect. 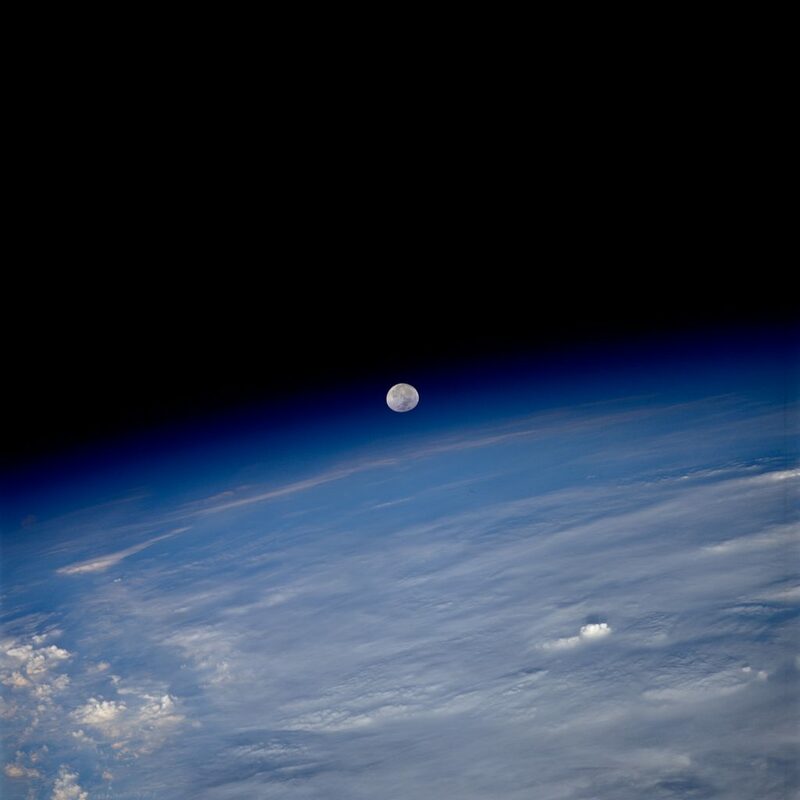 Our nearly 18 days in space gave us a chance to watch the moon cycle through over half its orbit around Earth. From the flight deck windows, the moon to us seemed close enough to touch. I think we will finally see Americans and our partners return to the moon’s surface within a decade, perhaps by 2027. NASA caption: STS080-759-038 (19 Nov.-7 Dec. 1996) — As photographed by the crewmembers aboard the space shuttle Columbia, a full moon is about to set beyond the limb of Earth. A full moon should be round but when it is near the limb, or edge of Earth, the atmosphere tends to distort the shape. 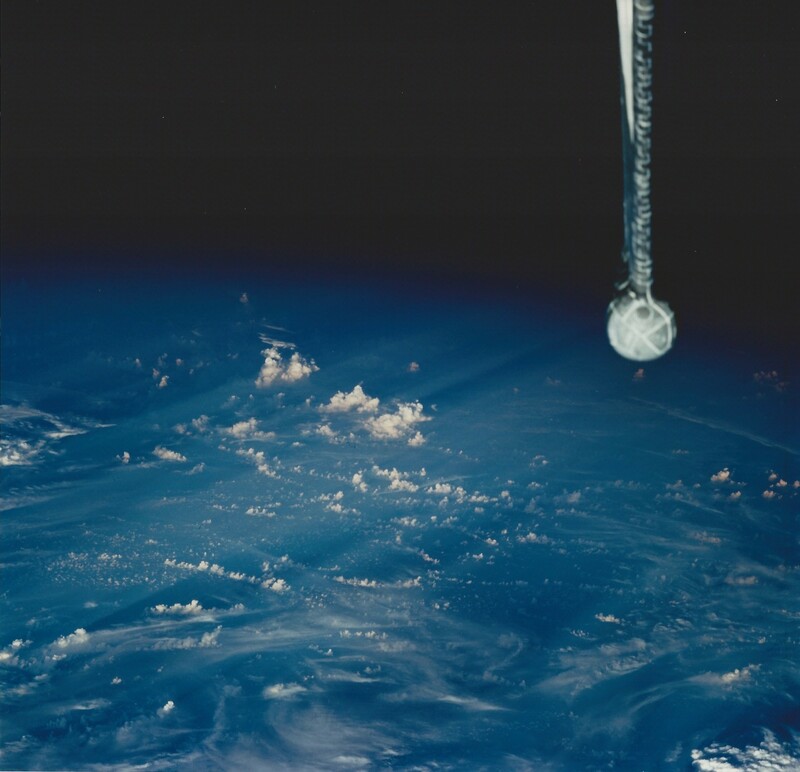 The atmosphere, stratosphere, ionosphere is in reality acting as a lens, thus the distorted shape of the Moon. As the Moon reaches the Earth’s horizon it will become “egg shaped”. 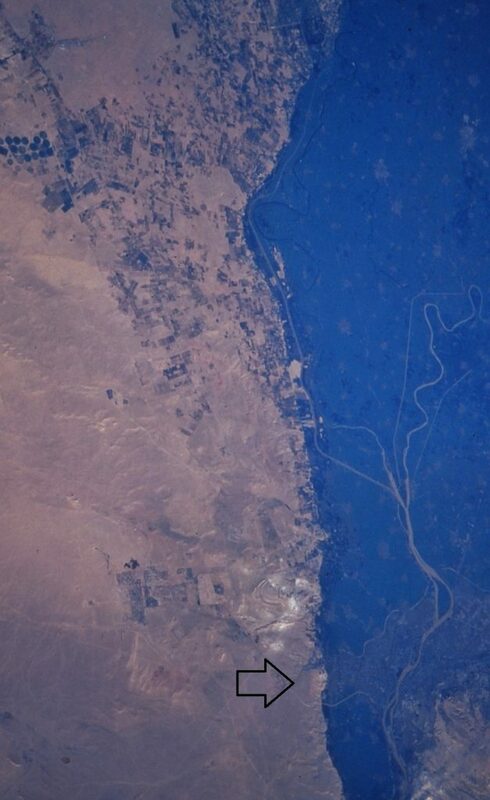 Our STS-80 crew obtained this photo of the Nile Valley and the Egyptian capital of Cairo, at bottom center. The arrow I’ve added points to the small, lighter patch of desert where the three great pyramids of Giza are located. Cairo is the gray urban area stretching right across the Nile flood plain to the main river channel. I can recall searching diligently for the pyramids with my telephoto lens, but never being quite sure I’d nailed them. If you zoom in on this digital image, you can make out the shadows of the two largest pyramids, those of Khufu and Khafre. ISS crews today get much better photos with their digital cameras and 80mm zoom lenses. This shot was taken on 35mm film with a 400mm lens. NASA captions: The Great Pyramids at Giza are the last of the Seven Wonders of the Ancient World and perhaps the most famous of the ancient monuments in the Nile River Delta of Egypt. They are also a favorite subject of photography from orbit. It is a short distance between the glories of ancient Egypt and the modern Cairo metropolitan area to the north and east. The buildings and streets of El Giza provide stark contrast to the bare rock and soil of the adjacent desert. Giza is a royal burial place, commissioned and built by pharaohs during the fourth dynasty around 2550 BC. Started by Khufu, continued by his son Khafre (Khafre pyramid and the Sphinx), and later by his son, Menkaure, the complex also includes many tombs and temples for queens, other members of royal families, and royal attendants. Today, Giza is a rapidly growing region of Cairo. Population growth in Egypt continues to soar, leading to new construction. New roads for large new developments are obvious in the desert hills northwest and southwest of the pyramids. Documenting patterns of urban growth around the world is a prime science objective for astronaut photography, now from the Space Station. We are standing in front of the external tank on the ET Hydrogen Vent Umbilical and Intertank Access arm, at the 167-foot level on Pad 39B. Above: Our first task after launch was to deploy the ORFEUS-SPAS satellite on Flight Day 1, so it could begin its astronomical observations. NASA Caption: Built by the German Space Agency, DARA, the ORFEUS-SPAS II, a free-flying satellite, was dedicated to astronomical observations at very short wavelengths to: investigate the nature of hot stellar atmospheres, investigate the cooling mechanisms of white dwarf stars, determine the nature of accretion disks around collapsed stars, investigate supernova remnants, and investigate the interstellar medium and potential star-forming regions. Some 422 observations of almost 150 astronomical objects were completed, including the Moon, nearby stars, distant Milky Way stars, stars in other galaxies, active galaxies, and quasar 3C273. Here, Tammy has ORFEUS-SPAS firmly in the grasp of the robot arm, ready for release. 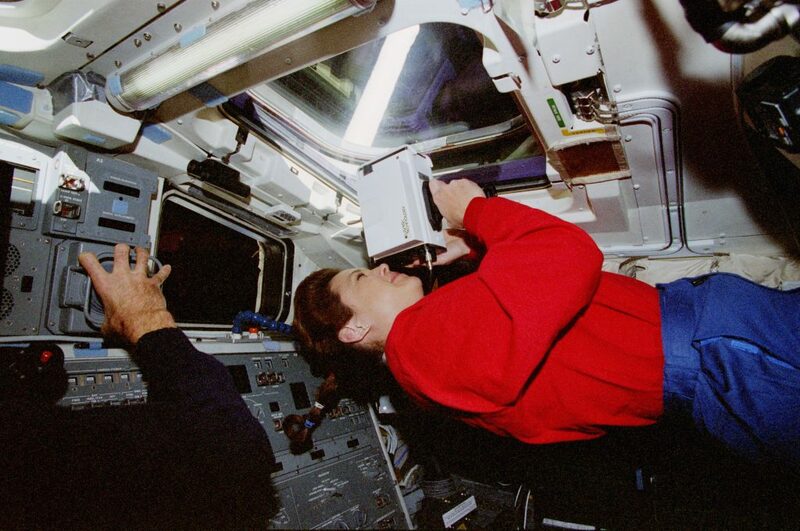 During our approach to pick up the Orbiting Retrievable Far and Extreme Ultraviolet Spectrometer – Shuttle Pallet Satellite (ORFEUS-SPAS) on flight day 15, Astronaut Tamara E. Jernigan, STS-80 mission specialist, uses a laser ranging device to check range and closure rate. ORFEUS-SPAS performed two weeks of astronomy observations during our mission. 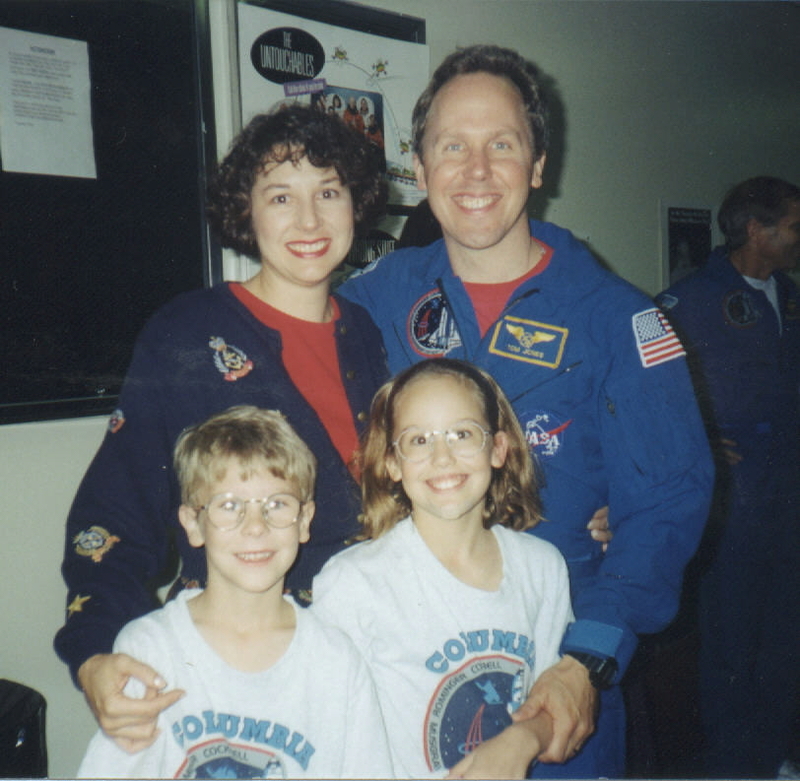 Tammy was the lead RMS operator for deployment and retrieval of the spacecraft. 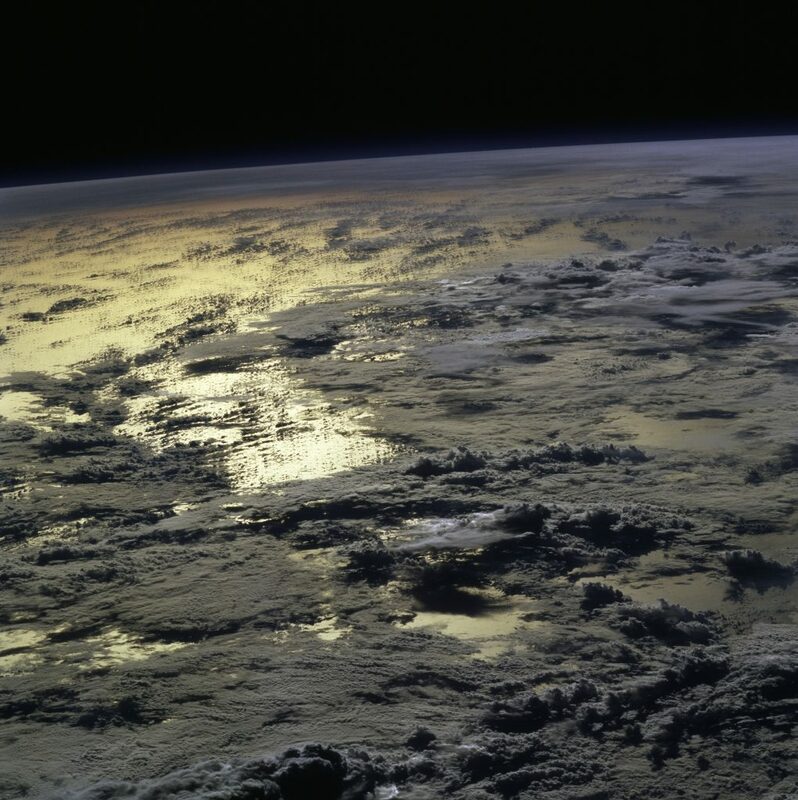 Below, a lovely view of Earth’s surface at sunset, with thunderstorms casting long shadows. 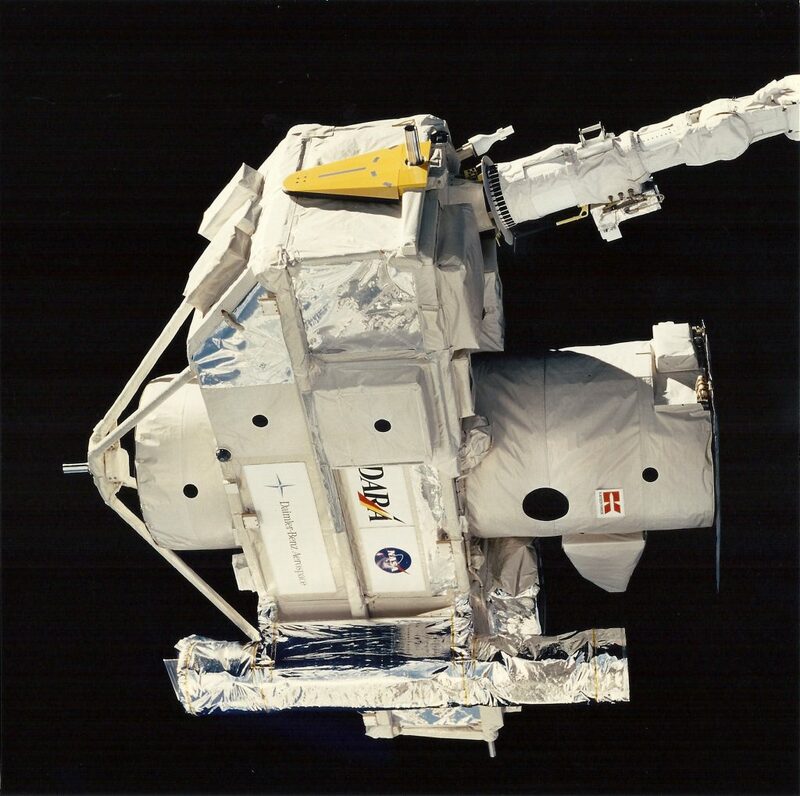 In the photo above, I operate the Remote Manipulator System (RMS) controls during retrieval of the Wake Shield Facility (WSF). 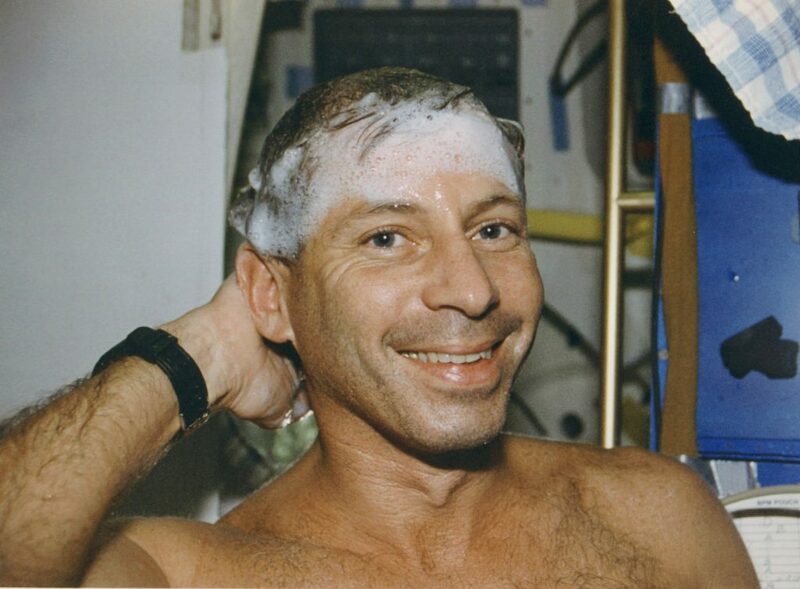 When this picture was taken, the free-flying WSF satellite–deployed for three days of orbital operations behind our orbiter– was already in the grasp of the RMS’ end effector, as evidenced by the video displayed on Columbia’s aft flight deck monitor behind my head. Taken 11/25/96. 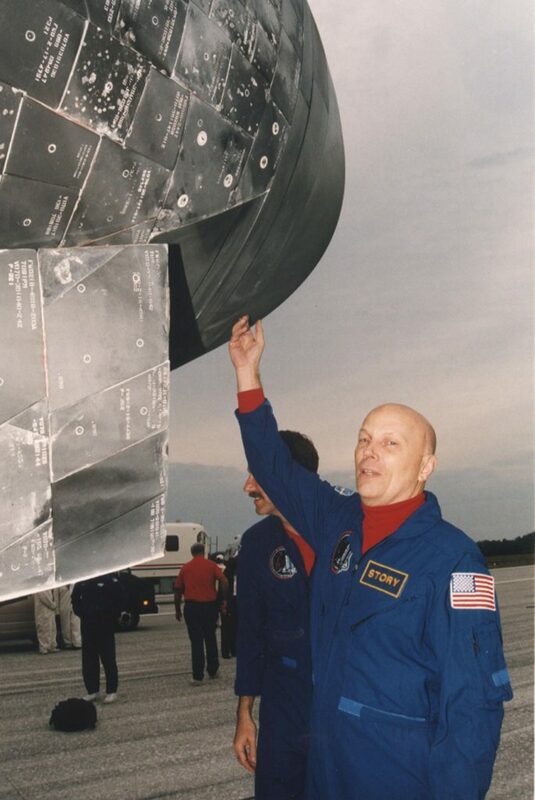 On 11/26/96, I regrappled the Wake Shield and maneuvered it above the payload bay during tests of our Space Vision System, using video cameras and laptop computers to image the black dots on the spacecraft and compute the 3D position of the satellite. The SVS would later be used to help assemble the International Space Station. 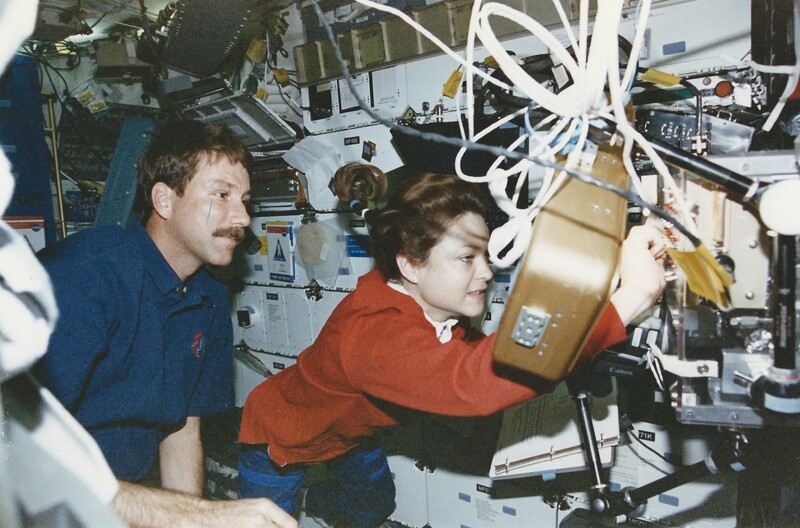 In the photo below, Tammy and I prepare our spacesuits and tools for our Flight Day 10 spacewalk (first of two planned EVAs), scheduled for Thursday, Nov. 28, 1996. The night before the EVA, our tools, suits, and associated gear nearly fill up the middeck. That’s Story with the pen in the foreground, running us through the EVA prep checklist. As one of the astronauts who’d fixed the Hubble telescope, Story was the man you wanted coaching you through a spacewalk. 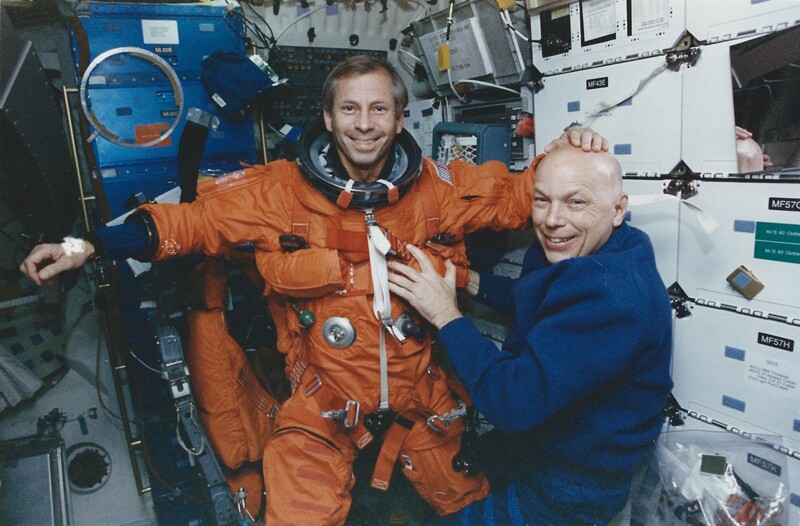 In Columbia’s airlock, Story Musgrave (hands at left) is pulling on Tammy’s right glove as we ready for our Thanksgiving spacewalk on Nov. 28, 1996. (It was thwarted by a loose screw that jammed the airlock outer hatch mechanism.) Tammy was EV-1, the lead spacewalker; note the red stripe on her suit backpack. 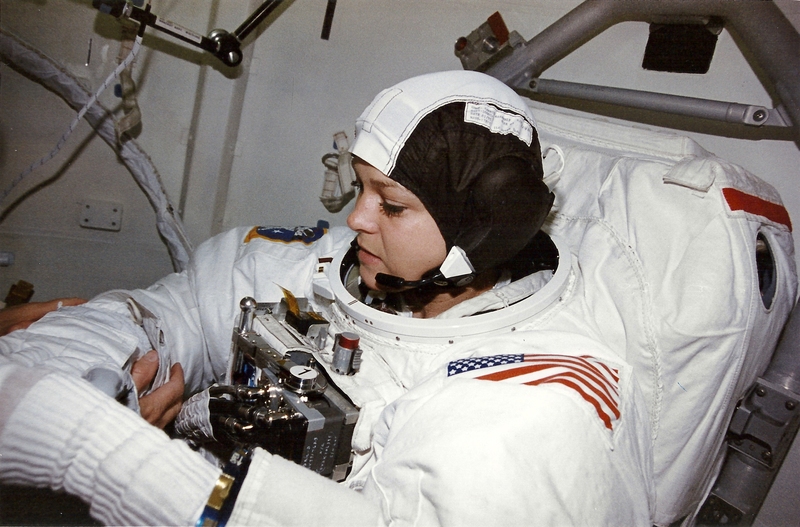 Connected to her suit’s DCU (display and control unit, on her chest) is the service and cooling umbilical (SCU), bringing ship’s power, oxygen, and water to the spacesuit while in the airlock. We would remove that connection just before opening the outer hatch at vacuum. Her backpack portable life support system (PLS) is still mounted to the airlock wall. 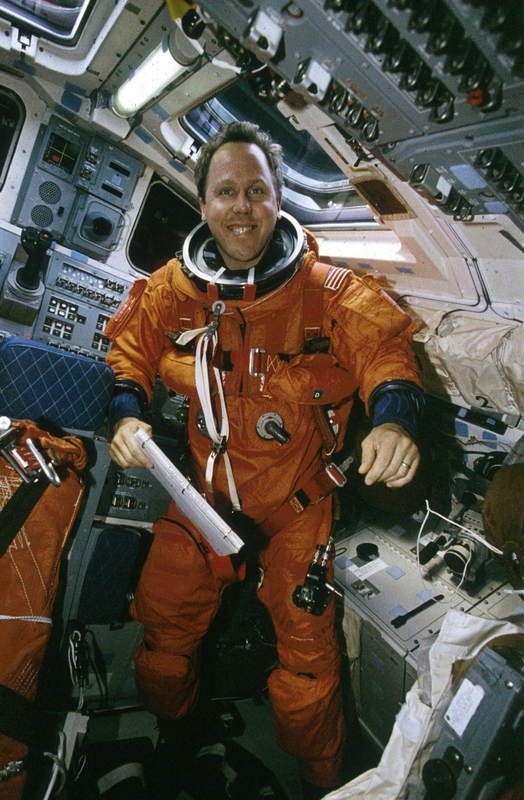 Story would release the backpack from the wall mount before exiting the airlock and closing the hatch leading to the middeck. With tools, cameras, and body restraint tethers, we were loaded for bear for this EVA. It’s amazing that we could actually maneuver inside that shower-stall-sized airlock, but free fall gave us full access to the head space in the airlock, easing the crowding problem. Story and I are enjoying breakfast in the galley on Columbia’s middeck, port side. Columbia’s nose is to the right. That gray drawer suspended at upper right is a food tray containing a few days’ worth of meals. I’m having a breakfast burrito of sausage and eggs. Story has an oatmeal package in his hand. Our food trash will go in that clear plastic bag on the left side near the airlock. Just behind us is a blue stack of drawers called the MAR, the middeck accommodations rack, with a food tray and drink bags velcroed to it. Behind story to the left is the open door to the bathroom, the WCS (waste collection system) compartment. 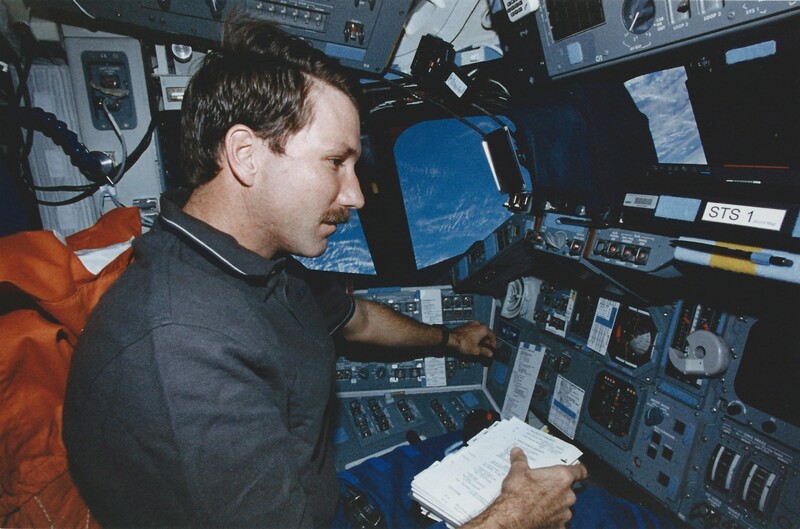 One of my jobs on the STS-80 mission was to manage the overall wiring setup for our many combinations of cameras, video recorders, laptops, and Space Vision System video processors. Here you see me with the labyrinthine Photo-TV checklist on Columbia’s starboard side, aft flight deck (payload bay windows to right). The black box is a video tape recorder, or VTR. A Canon video camera is just to the right of my chin. The “4-5-6-7” pouches contain the Sky Genie escape ropes that we’d use to exit the flight deck out the overhead window, after a landing emergency. (Not much call for those ropes 220 miles up). That’s a St. Christopher (patron saint of travelers) medallion floating on a silver chain around my neck. Taco washes his hair using rinseless shampoo. Fill a shampoo pouch with hot water, squirt onto scalp, lather up. Dry with a clean towel (seen at upper right). Comb or brush. Taco here is on the middeck, with the side hatch area behind him. On an 18-day mission, personal hygiene in Columbia’s small cabin was an important obligation, especially after a workout. With Earth visible over Story’s shoulder, he monitors the Wake Shield satellite trailing us on Columbia by about 30 miles. The commander’s orange pack parachute is visible at left. Story had mounted his Wake Shield laptop atop the pilot’s (Kent Rominger’s) seat back, a perch only possible in free fall. The laptop received data from Wake Shield via an output cable from the shuttle’s Pulse-Code Modulation Master Unit, the PCMMU (puck-a-moo). Story is wearing that patch on his polo shirt. His four crewmates all participated in awarding Story this honor. As we encountered problems and challenges on this mission, we could always rely on his experience to put things in perspective and come up with creative solutions. Story is still a great mentor and friend. 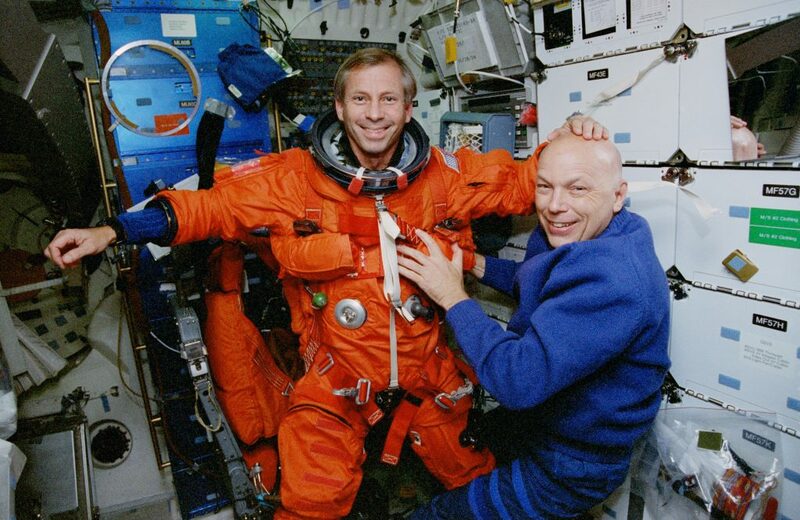 On Columbia’s middeck, Story helps Ken Cockrell don his launch and entry suit (LES). Story is forward at the middeck lockers; Taco is near the port-side hatch, over there to the left of the blue MAR rack. Story’s reentry seat next to the MAR is already installed to Taco’s right (he didn’t sit in it during reentry). The circular, clear cover at upper left is the UV hatch filter usually installed over the side hatch window. At far left is the gray metal box containing the escape pole, rigged for bailout in an emergency. Those blue velcro squares below it are on the hatch surface itself, which in flight is part of the waste collection system compartment–the shuttle’s bathroom. Rommel and Tammy work on the starboard side of the middeck with the Capillary Action Pumped Loop science payload. They are taking video and watching one of the experimental runs, showing fluid in motion in free fall via capillary action, a possible system for removing heat using a working fluid without moving parts, like motors and pumps. Experiments like these were a daily activity for all of us aboard Columbia. In this shot I’m “standing” next to my flight deck seat (left) on entry day. 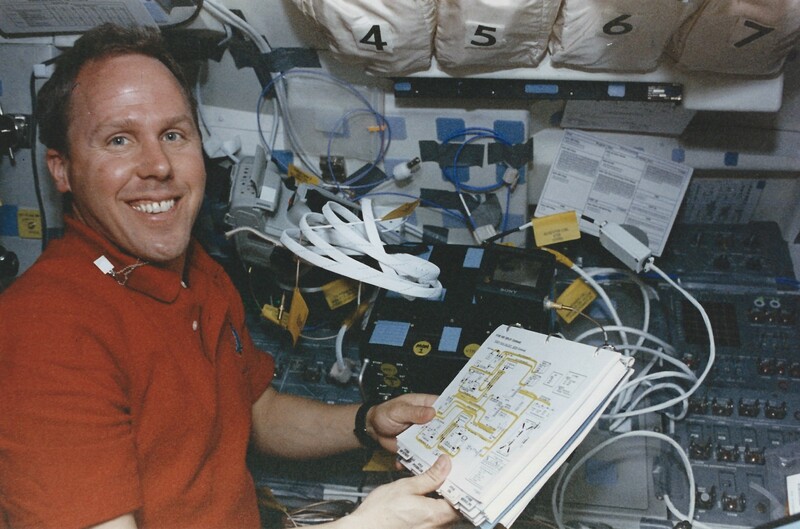 No doubt that is the deorbit prep checklist I’m holding. I’m wearing my launch and entry suit; I’ve got the parachute harness on already; the ‘chute is already in place on the seat. Hung on the side of the seat is my gray intercom box and a thermoelectric chiller to circulate cold water through my long underwear during reentry. Over on the port side (right) is a gray Canon video camera. Those windows behind me look back into the payload bay. 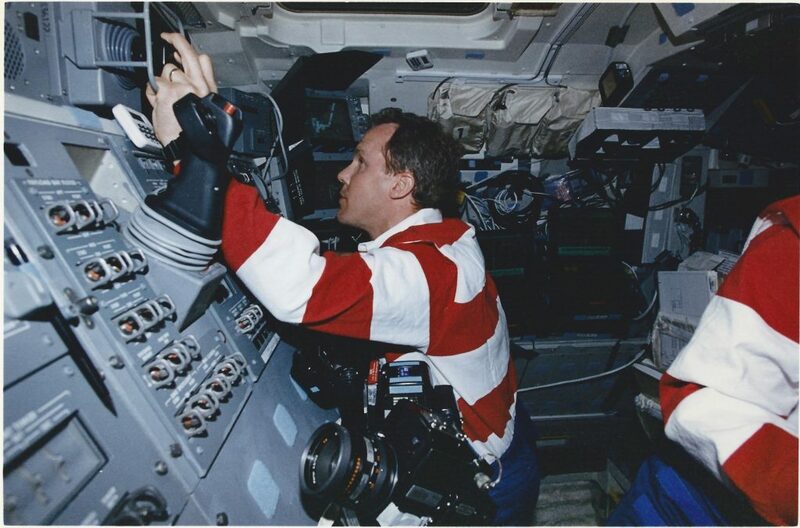 Surrounding me are the hundreds of switches and controls of the aft flight deck–part of our home for 18 days on the STS-80 mission. 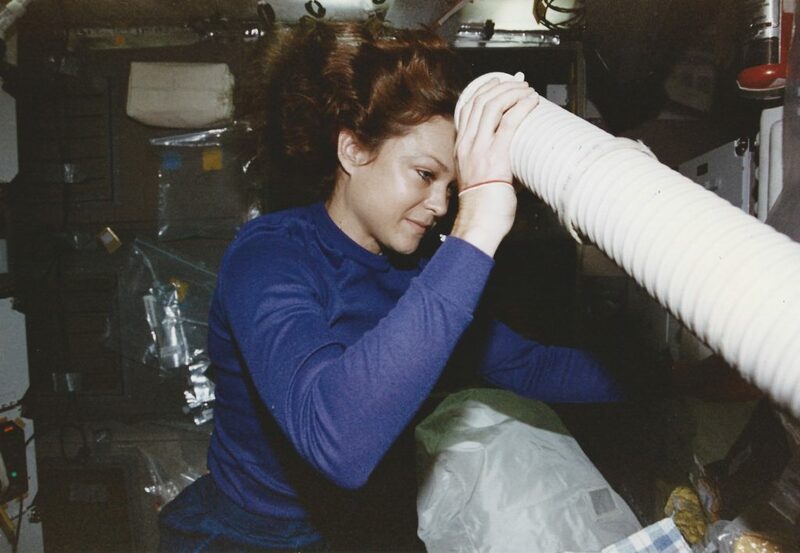 On Columbia’s middeck, mission specialist astronaut Tammy Jernigan has just finished washing her hair. She’s using the life support system’s fresh air outlet hose (which everyone calls the elephant trunk) to speed the drying process considerably. Unfortunately for her, it’s not hot air–just cool, clean, conditioned air. The forward equipment lockers are to the left, our sleeping bunks at rear, and the airlock just out of view to the right. Note the meal pouches waiting for preparation at lower right. Behind Tammy’s head you can see one of our individual toiletry kits, a Personal Hygiene Kit, or PHK. 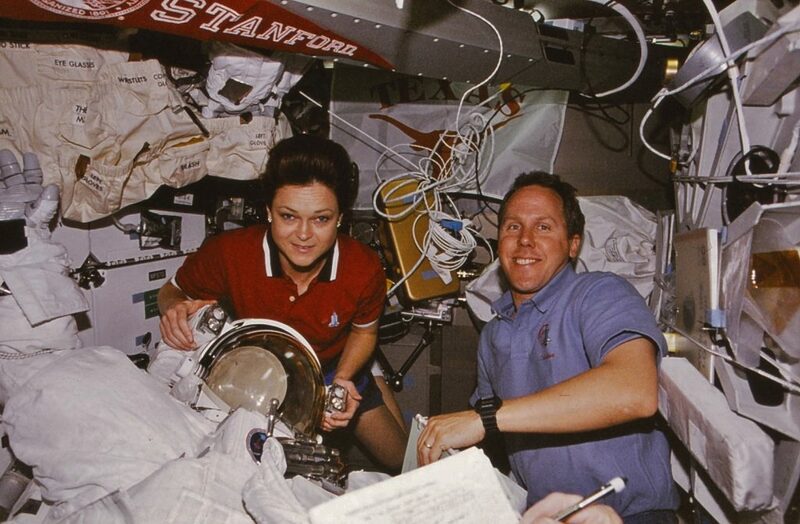 Below Tammy’s left elbow is a stowage bag, probably holding some of our dirty laundry after nearly 18 days in orbit. 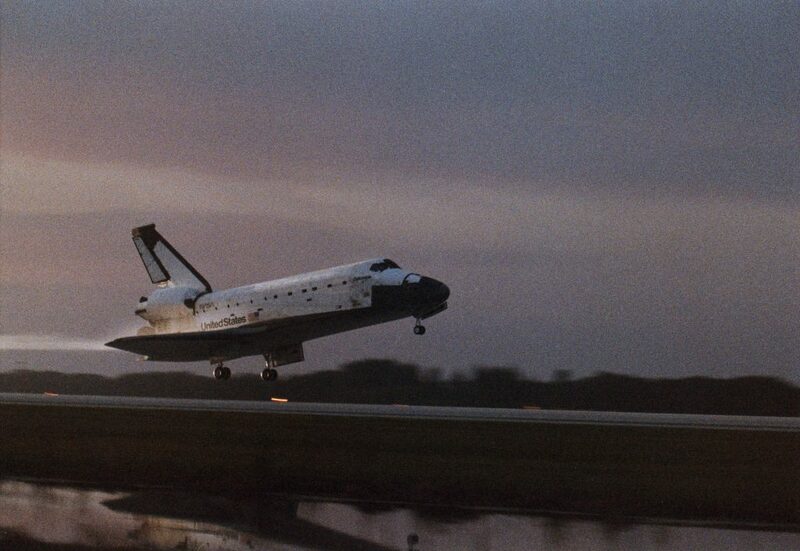 As we prepared for entry–three times!–we set up Columbia for her return to Earth and got dressed for our trip back through the atmosphere to KSC. Here Taco is wearing his base layer of long johns, plus our water-cooled Patagonia underwear, as he works through the Entry Prep Checklist. His parachute is already in the seat; his suit is waiting downstairs in the middeck. A snack of dried apricots is velcroed on the dash. All those cardboard cue cards are memory aids for reentry, everything from “go–no-go” equipment lists to test piloting tasks to perform during the hypersonic phases of our descent. By the time we actually got weather good enough to return to Florida, we’d rehearsed this twice and were ready for the real thing on Dec. 7, 1996. Was this a terrific moment? From the flight engineer’s seat (MS-2), I could feel Columbia settling gently toward the xenon-lit runway ahead, with Taco handling the landing beautifully. Rommel was calling out the speed and altitude–we were right on the profile. 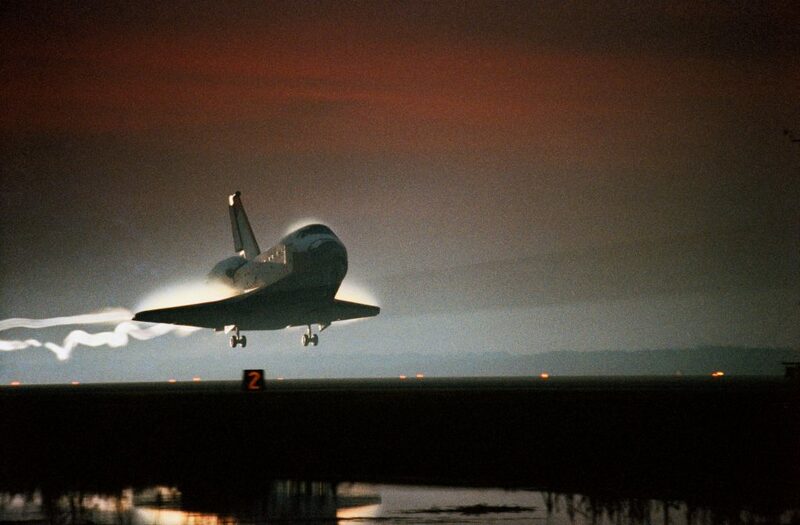 NASA Caption: Just prior to dawn, the space shuttle Columbia heads for a landing on Runway 33 at the Kennedy Space Center’s (KSC) Shuttle Landing Facility (SLF) to successfully complete a 17-day mission. 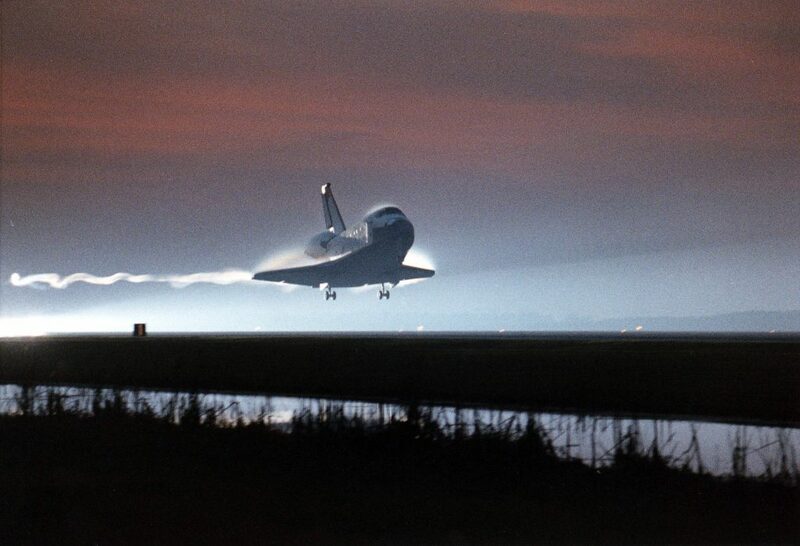 Landing occurred just before dawn, at 6:49 a.m. (EST). 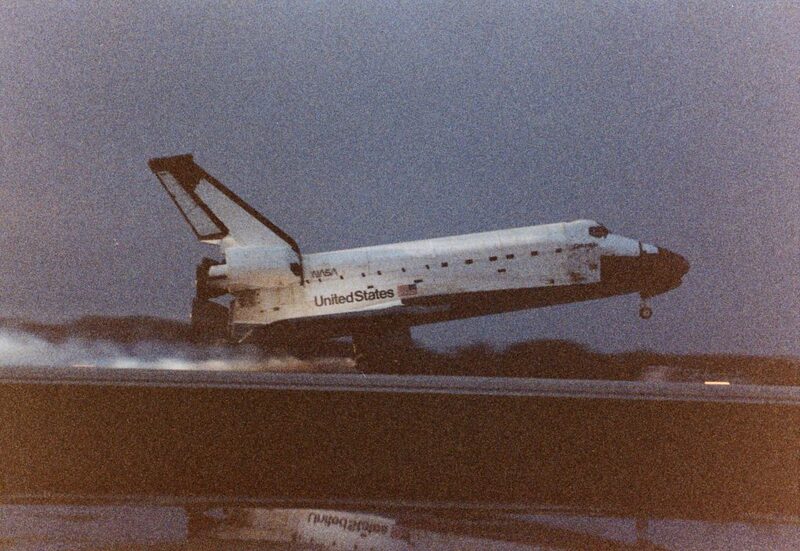 The landing was the 33rd at KSC for the Space Transportation System (STS). 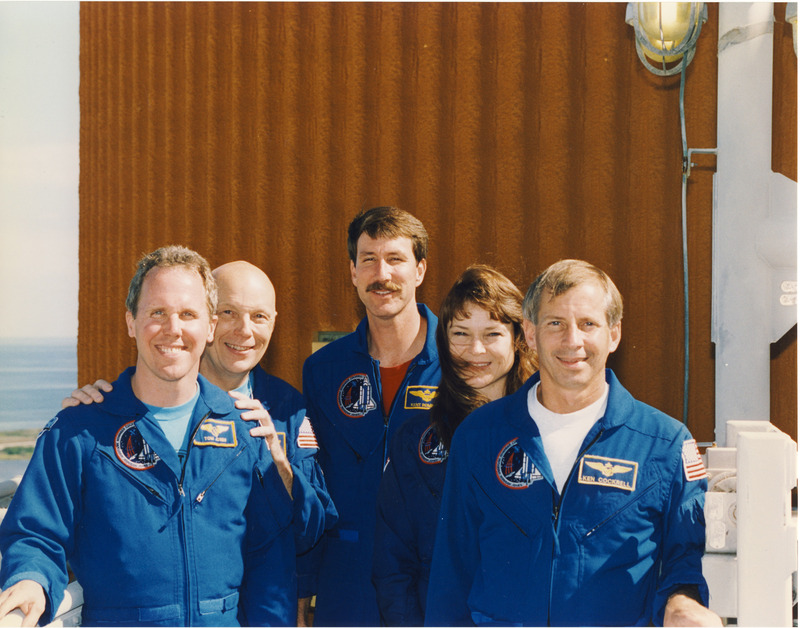 Crew members on STS-80 were astronauts Kenneth D. Cockrell, mission commander; and Kent V. Rominger, pilot; along with Story Musgrave, Tamara E. Jernigan and Thomas D. Jones, all mission specialists. Above: I was sitting just behind Taco and Rommel as they flew our near-perfect spaceship to a smooth landing at Kennedy Space Center. Taco’s touchdown was so smooth that none of us could truly tell the wheels were actually on the concrete. I had to look for the on-screen indication that the flight computers had received a touchdown message from the landing gear squat switches. Grease job! Well done! Above: Smoke bursts from our main landing gear tires as they kiss the concrete at about 220 knots. Taco brought the ship to a stop and exclaimed: “My knees are shaking!” He was experiencing that blast of adrenaline released on final approach; now that we were stopped, he could enjoy the special satisfaction of a great landing. Right behind him, I joined in the crew’s exhilaration. 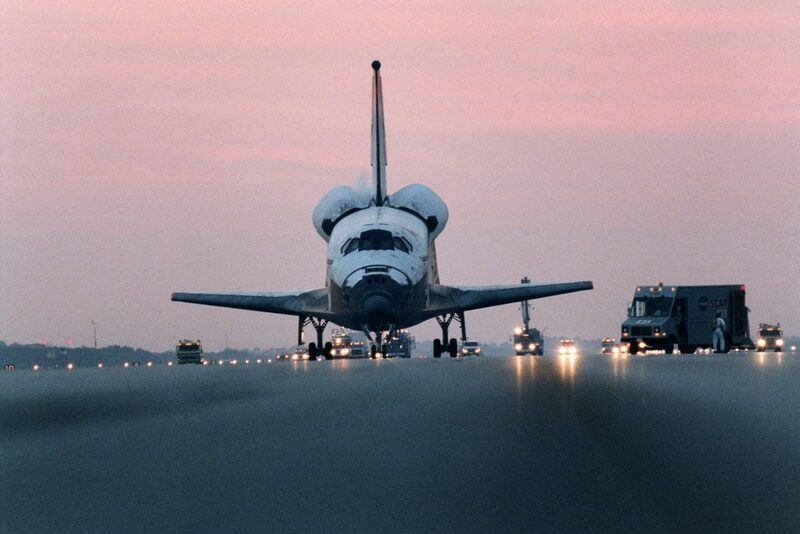 Back on Earth after 18 days–longest shuttle mission in history! 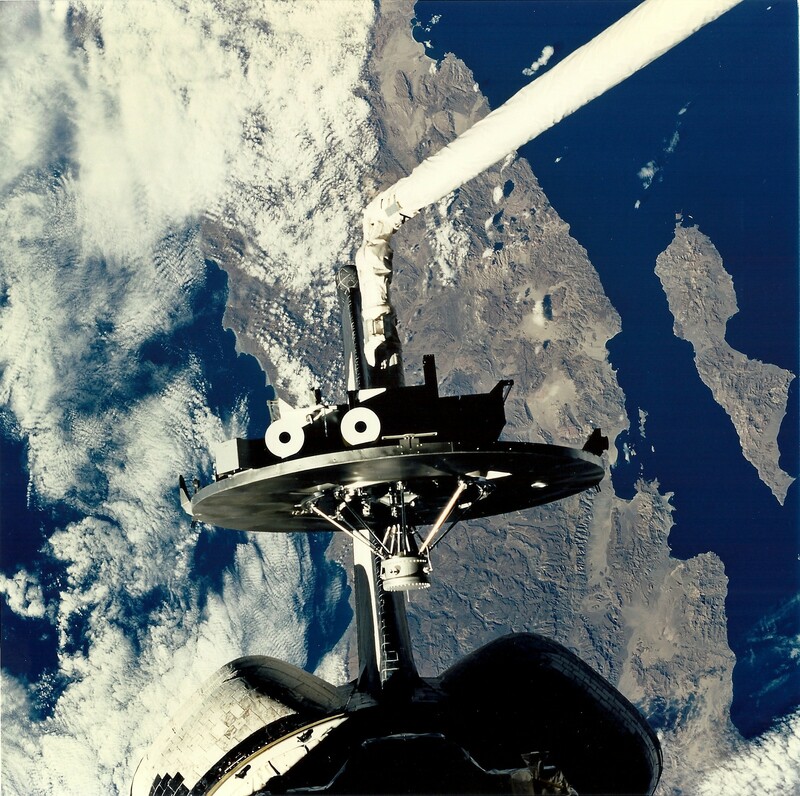 Our beautiful spacecraft, Columbia, at rest after nearly 18 days in orbit. The ground support convoy has joined us to inspect and shape the orbiter, and ready her for crew exit. Oh, and the sun is coming up! For a commander like Taco, there’s no better feeling than having brought a $2-billion spaceship and crew back for a perfect landing. Story is a man for the record books. 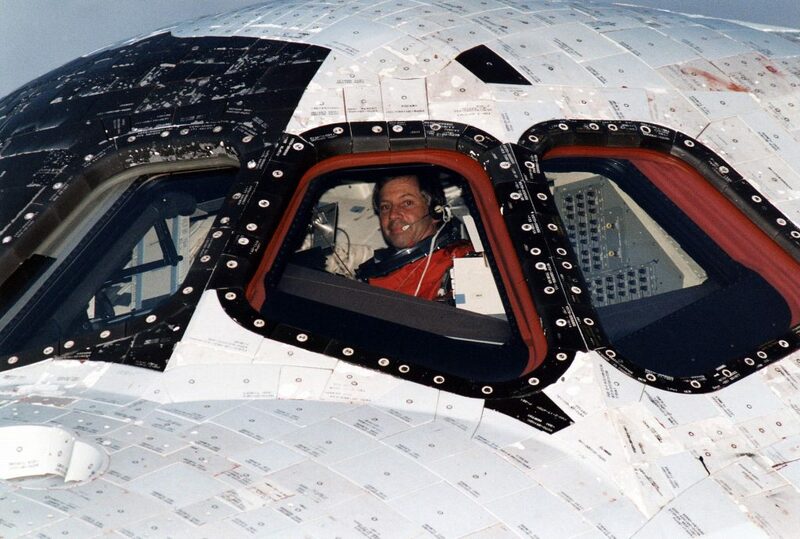 He flew on all five shuttle orbiters. Inspection of the orbiter complete, our crew–on gimpy legs–prepares to board the Astrovan for our trip back to crew quarters and a reunion with our families. I wondered if that airlock hatch was still jammed. Above, worries about the jammed hatch and lost spacewalks disappear when I rejoin Liz, Bryce, and Annie. Best…moment….ever. 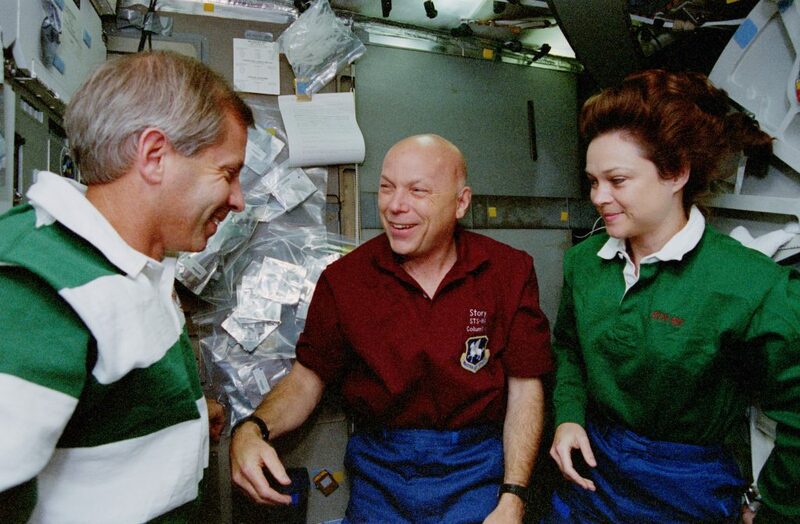 Story Musgrave (L), Tom Jones, and Ken Cockrell visit their STS-80 boosters at the Thiokol (now ATK) plant in Promontory, Utah. January 1997. 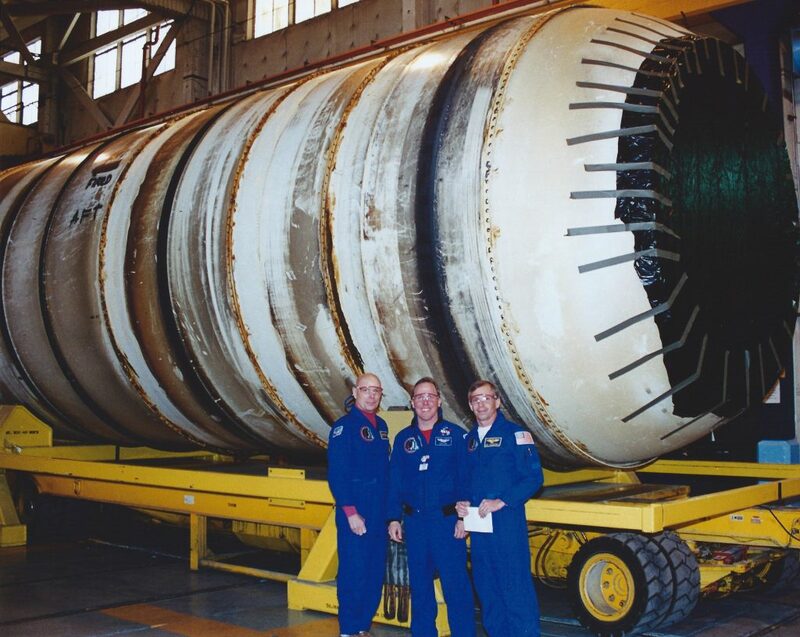 Three of our crew visited the factory in Promontory where our flown STS-80 boosters had been returned for cleaning, disassembly, and reuse. We are standing by the aft end of our booster; the nozzle was jettisoned during descent to splashdown, and the aft skirt has been removed. Inside, the rubber insulation lining the steel booster casings is visible. The exhaust temperature of the booster in flight is about 5,000 degrees F, while the insulated steel of the casings never gets above ambient temperature during firing. 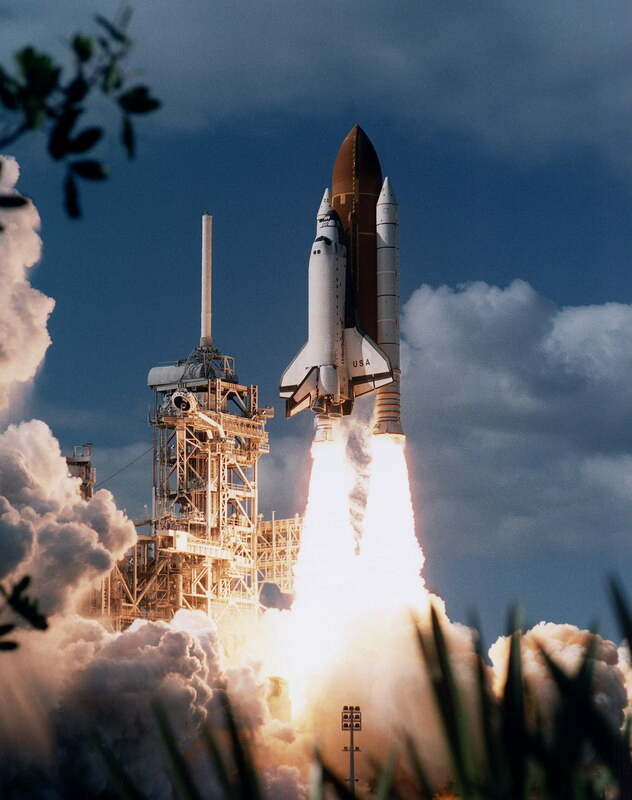 An engineer told us that as far as the steel was concerned, the stresses of STS-80 launch, ascent and booster splashdown made for an unremarkable, “ho-hum” day. The people who built and prepared these boosters for flight held our lives in their hands, and we are still grateful for their professionalism and expertise. Longer, five-segment boosters like our four-segment shuttle boosters will power the mammoth Space Launch System rocket. 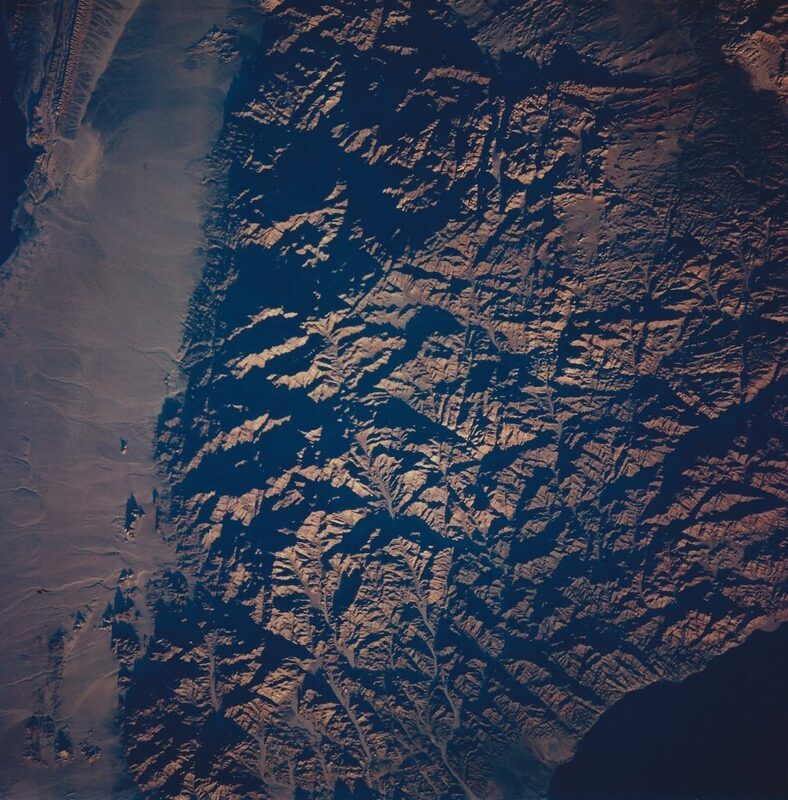 Our Space Radar Lab 1 crew on Endeavour, STS-59, took this shot into the heart of the Andes during the first week of our Mission to Planet Earth. 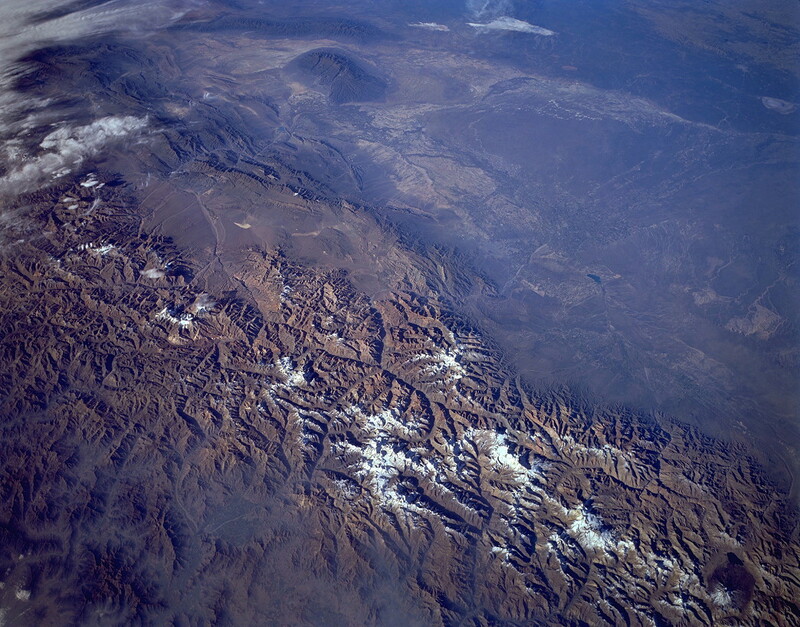 This view looks across the Andes from orbit, about 134 miles above Valparaiso and Santiago, Chile. The backbone of the Andes runs from upper left to lower right, with north at upper left, south to lower right. The highest reaches of the Andes are topped with snow and ice in mid-April (early autumn in the southern hemisphere). The prominent M-shaped peak at center-left, beneath the smooth basin, is Cerro Mercedario, the highest peak of the Cordillera de la Ramada range and the eighth-highest mountain of the Andes. Mercedario rises to 6720 meters, about 22,050 feet. South of Mercedario, just left of center, is the prominent white peak of Aconcagua, the highest mountain outside of Asia, at 6,961 metres (22,838 ft), and by extension the highest point in both the Western and Southern hemispheres. Aconcagua is not a volcano, but an upthrust block of the Andes lifted by the collision of the Nazca tectonic plate with the South American plate. At top center is the city of San Juan, lying beneath the bread-loaf-shaped ridge to the east of those eroded ridgelines at upper left. The salt lake Lago Pampa de las Salinas is the arrowhead-shaped lake at top center. The exceptionally clear air over the Andes and the mountains’ ruggedness make this view almost three-dimensional. It’s almost as if I’m back up there! 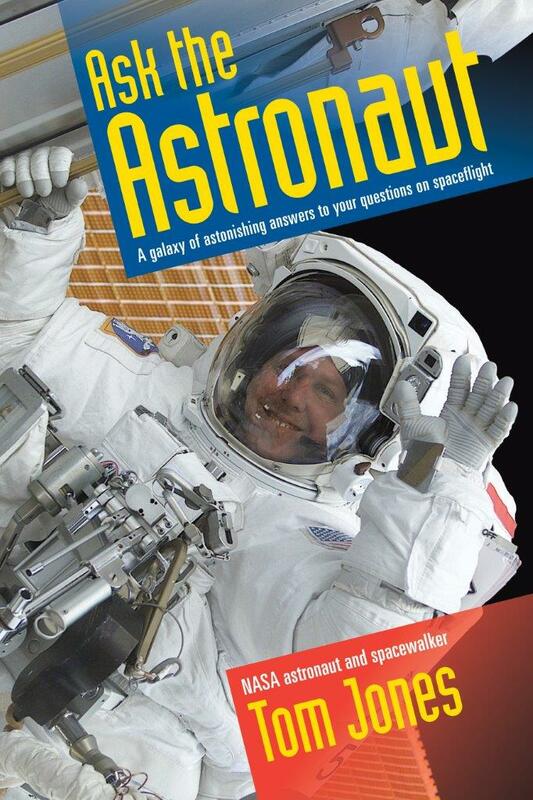 Read my chapter “Seeing Space” in “Ask the Astronaut” for more perspectives on Earth, at AstronautTomJones.com. During the week of April 11, 2011, the FBI released some of its investigation records on UFOs. The reports reflect the reality that people do see unexplained phenomena in the sky. Are these sightings evidence for intelligent life elsewhere, or some secret flight testing program? 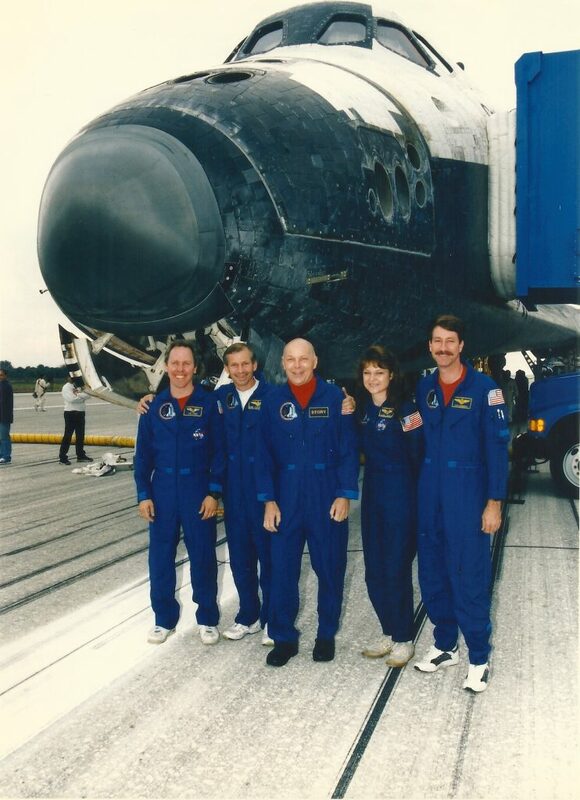 Much UFO speculation in the past has focused on one of my shuttle missions, STS-80, flown in late 1996. Some have maintained that video shot during this Columbia space shuttle flight provides evidence for unknown objects moving in the night sky. I have reviewed this video (for the first time in 1997), and conclude that it shows commonplace and well-known objects near the shuttle, all of them observed on every shuttle flight. These videos show low-light television camera images of ice particles or man-made debris drifting out of Columbia’s cargo bay, and floating in the vicinity of the shuttle, likely within a few tens of feet of the orbiter. I have seen these snippets of STS-80 video many times since our flight. These video scenes were recorded by remote control, under ground command, with flight controllers in Houston’s Mission Control operating our low-light TV camera in the cargo bay. As far as I remember, nobody on the crew was looking out the window at these ice crystals or debris particles. 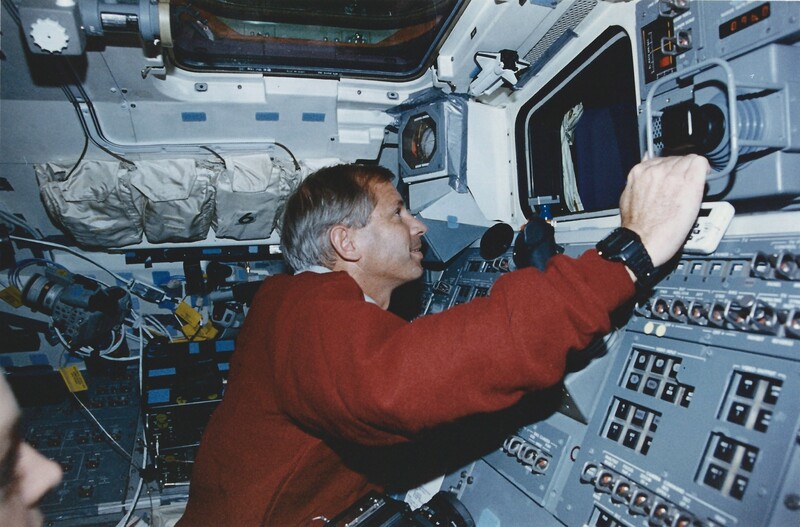 Nobody thought anything that our crew observed out the window was of “alien” origin, or something not connected to the shuttle’s routine operations (e.g. a large rotating disk or any such unusual structure). 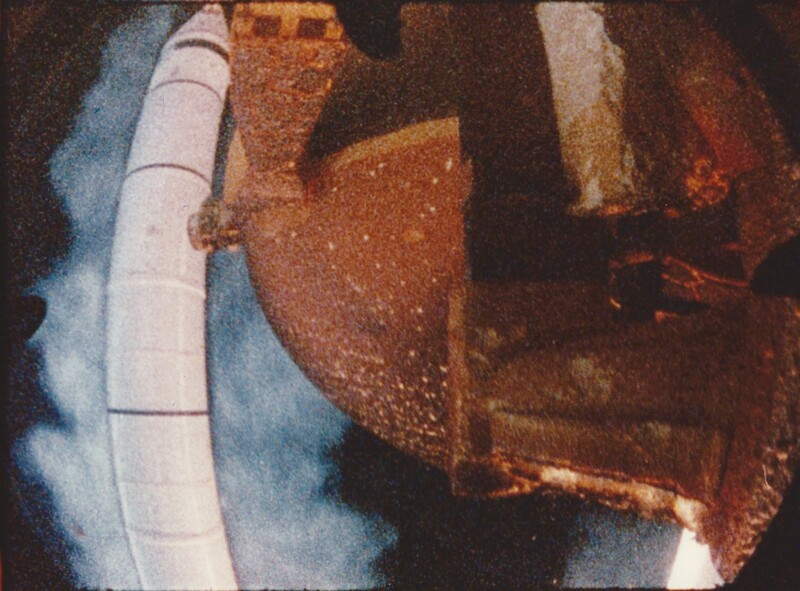 Once you understand what the solar illumination conditions are (orbital twilight, with darkness below and sunlight at our altitude), it’s easy to conclude that the video shows normal small ice and debris particles drifting aimlessly away from the orbiter, with some pieces becoming sunlit as they move out of the shuttle’s shadow. During our science operations, robotic satellite deployments and grapples, and robot arm tests and exercises, we routinely noticed these ice particles and debris catching the brilliant sunlight outside. But these sightings were non-events for us, as we understood what we were seeing completely. Both the flight crew and Mission Control are always attentive to particles seen outside the windows, or on payload bay cameras. Such sightings could be clues to spacecraft problems, such as a vital piece of equipment that has shaken loose. Those sightings need to be reported ASAP and openly discussed — is it a fuel leak, or a piece off the rudder, or damage to the TPS (tiles), or other bad news? Crewmembers and flight controllers have no reason to ever keep it secret or to keep these discussions off normal radio channels. Aside from details of specific Defense Department payloads and their deployments, astronauts have no classification regulations or rules preventing anyone from discussing anything they’ve seen or experienced on space flights. No secret non-disclosure signatures, no secret threats, no secret brainwashing–we communicate openly with the public. What we get, you get. What we see that’s unusual, we tell you about. I have spent many hours gazing out the shuttle windows during my 53 days in orbit, under all lighting and orbiter attitude conditions. 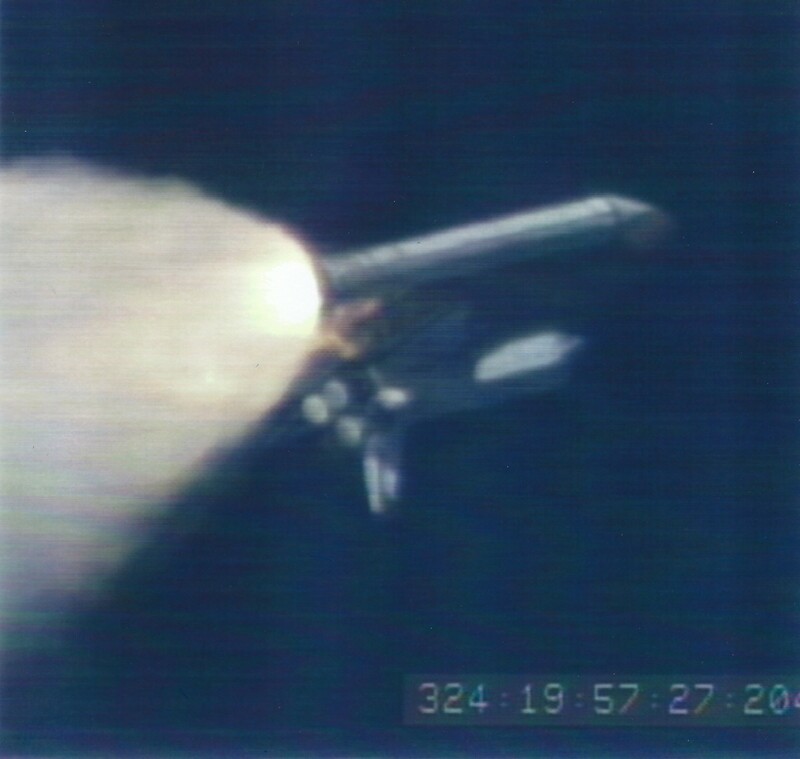 The objects seen in the STS-80 videos are ordinary debris particles or ice crystals, some hit by shuttle thruster blasts that cause a change in their motion. Local lighting conditions also change the brightness of some objects as they drift into or out of shadow. I have never seen any evidence in space or on Earth of spacecraft or phenomena not explained by our routine space operations in the shuttle or Space Station programs. My crewmates and I have not seen any evidence for UFOs or spacecraft of “alien” origin or behavior. 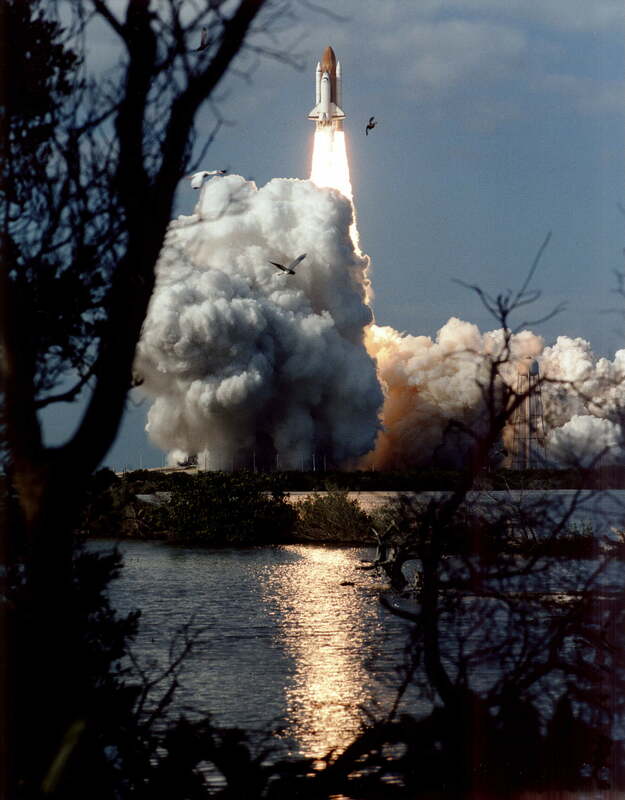 The STS-80 videos are records of normal space shuttle operations and optical phenomena. It is regrettable that so many spaceflight-minded young people have their enthusiasms exploited by misinterpretations of such shuttle videos. These inaccurate theories about what the videos show–some naive, some possibly deliberately misleading–waste a great deal of productive energy. Insisting that astronauts have seen alien vehicles is incorrect: a deliberate falsehood. This myth wastes years of healthy curiosity and diverts it to pseudo-scientific wild goose chases, and is a disservice to the fantastic and dedicated work done in orbit by Space Station and shuttle crews, and their support team on Earth. 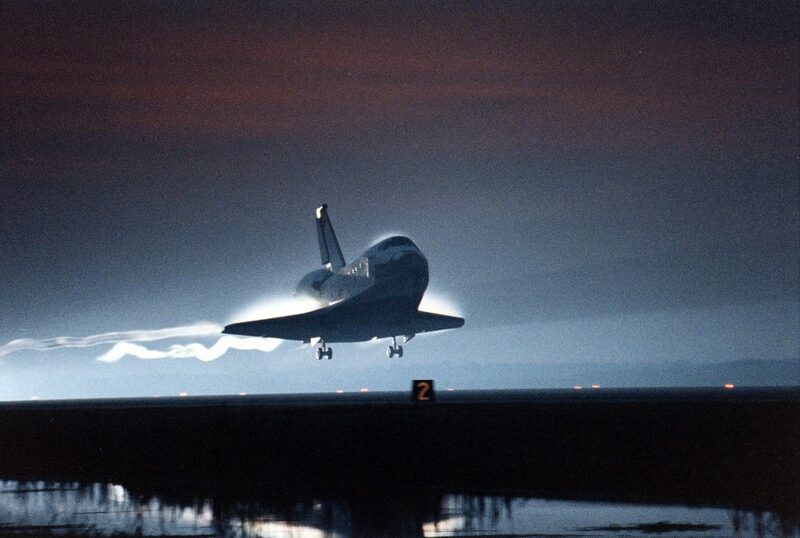 Those still arguing about non-existent UFOs seen by space shuttle crews are wasting their time. Worse, they are misleading young explorers who don’t deserve to miss out on the genuine thrills and wonder of the spaceflight experience, its importance for the advancement of our species, and our understanding of the home planet and our universe. Author of Ask the Astronaut, Sky Walking: An Astronaut’s Memoir, and Planetology: Unlocking the Secrets of the Solar System. Review of Ask the Astronaut: Two Big Thumbs Up! 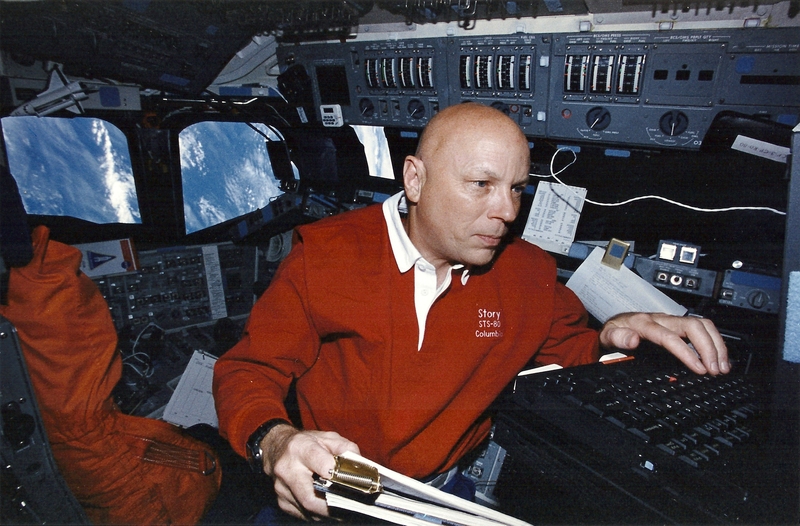 The former space shuttle astronaut and planetary scientist has written a treasure trove of answers to FAQs about modern space flight. The text is well organized, with questions categorized into chapters that explain the different steps in the process of aspiring to, training for, and living and working in space. Jones answers scores of questions that he has received over the years at public forums, from “Where should we send astronauts next in space?” to “Have astronauts ever seen space aliens?” Most of the book focuses on NASA’s space shuttle voyages to the International Space Station, because this is Jones’s greatest area of experience as an astronaut. The technical descriptions in the answers are a bit complex, but the firsthand details and comprehensive back matter make this an ideal addition to any junior high or high school library. VERDICT A fascinating look at space travel that will excite budding STEM students.–Kelly Kingrey-Edwards, Blinn Junior College, Brenham, TX. Thanks, Kelly! Grateful for the review. Ask your library to stock this book, and of course, get your own copy! I have autographed copies for sale at AstronautTomJones.com. Early spring in the Appalachians jumps out at the astronauts aboard Endeavour, STS-59, Space Radar Lab 1. 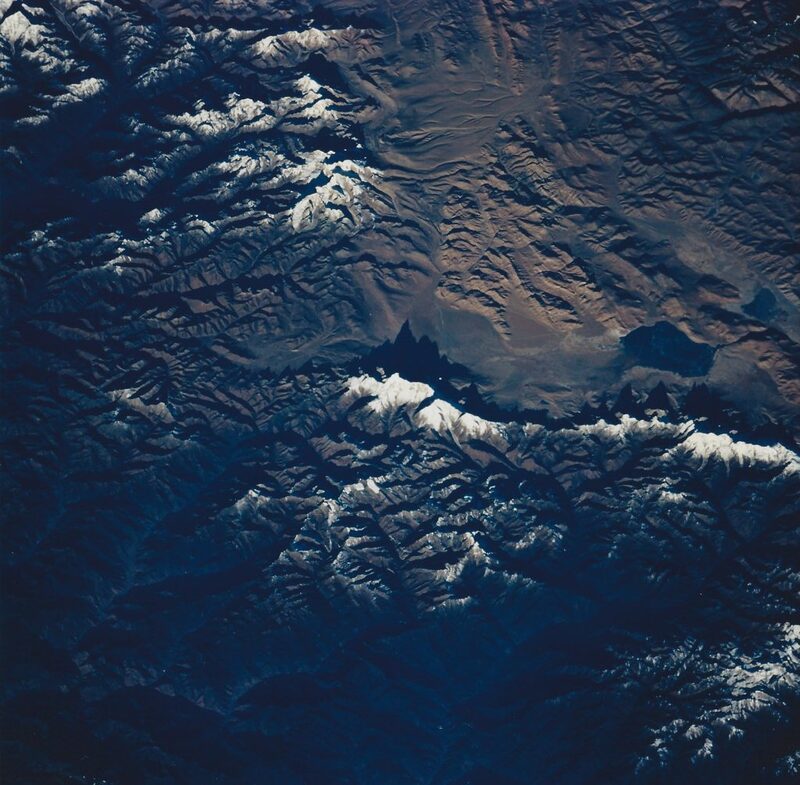 At an altitude of about 120 nautical miles, the Endeavour crew used a Hasselblad camera body with a 40mm lens to capture this northward view. Moving up the coast, at the head of the Chesapeake, the Susquehanna River flows in from the west (left) in a dark green valley that slices through the mountain ridges. Philadelphia is next in line, on the Delaware River, with the dark green of the Jersey pine barrens at upper right. Finally, Long Island and New York City are visible at top right. The Finger Lakes in upstate New York are at upper left, along with the shore of Lake Ontario. The ribbon-like sweep of the Appalachians dominates the center of this photo; these are the eroded roots of a folded chain of mountains that were once as high as the Rockies. The easternmost ridge at center is the Blue Ridge, and at bottom right is the silvery squiggle of the south fork of the Shenandoah River, flowing north to the Potomac along the western face of the Blue Ridge. New spring leaves have not yet emerged at the higher elevations of the Appalachians, leaving just the rust-brown hue of fallen leaves and bare branches along the ridges. One can see the barrier that the Appalachians presented to early European settlers, confining them largely to the eastern seaboard for the first 150 years of settlement in eastern North America.